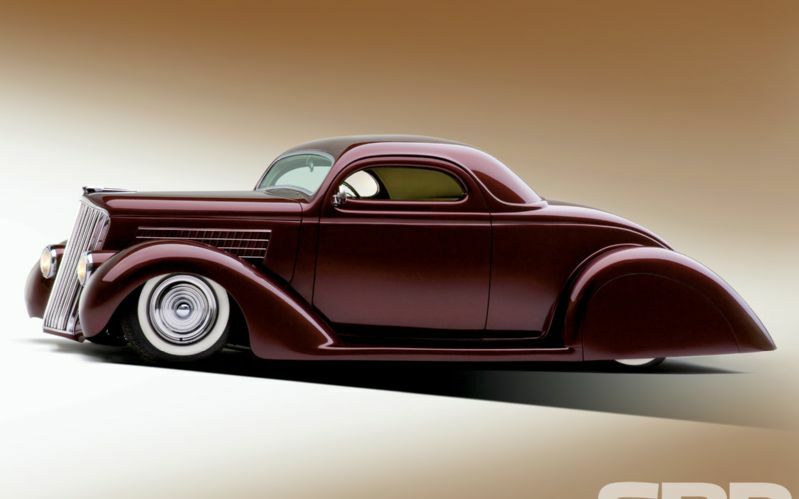 Oftentimes we can be in awe of a hot rod so well done we aren't sure where to begin or even where to point and say, "There, that's what makes this car so special, so different from the rest." 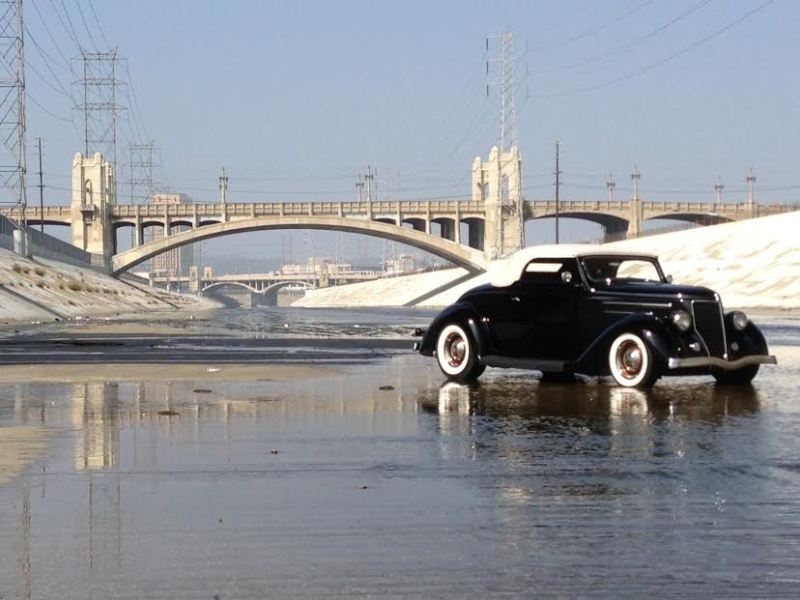 "Bugs", from SoCal, enjoyed the lines of the original Lincoln Zephyr, but not having one he took a different approach. 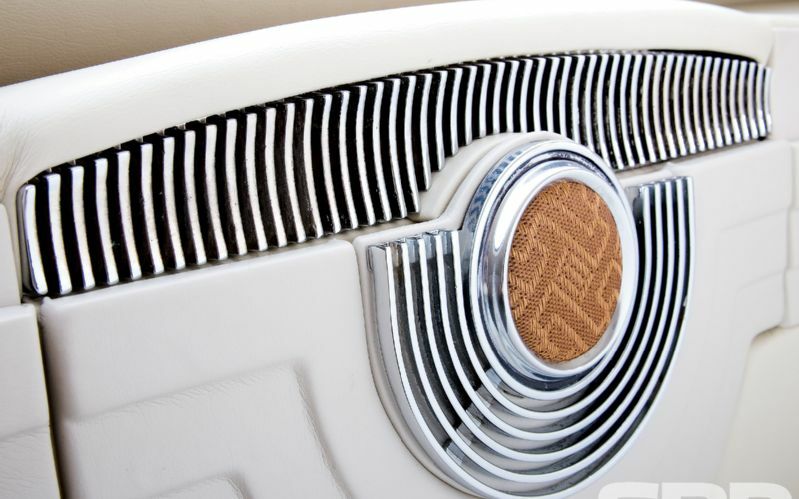 He felt the Zephyr styling reflected his like of the art-deco era and knew he wanted to incorporate this look and feel into his custom. 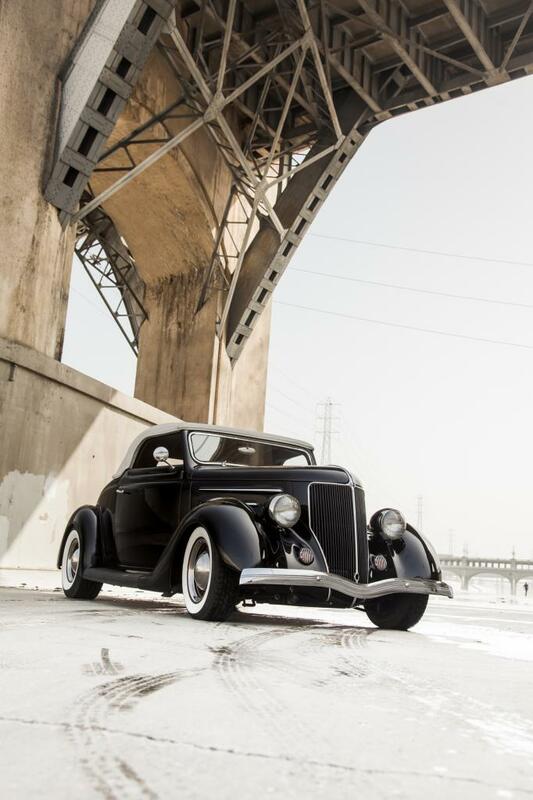 His '35 Ford custom coupe just might be one of those cars that's special, different from the rest. 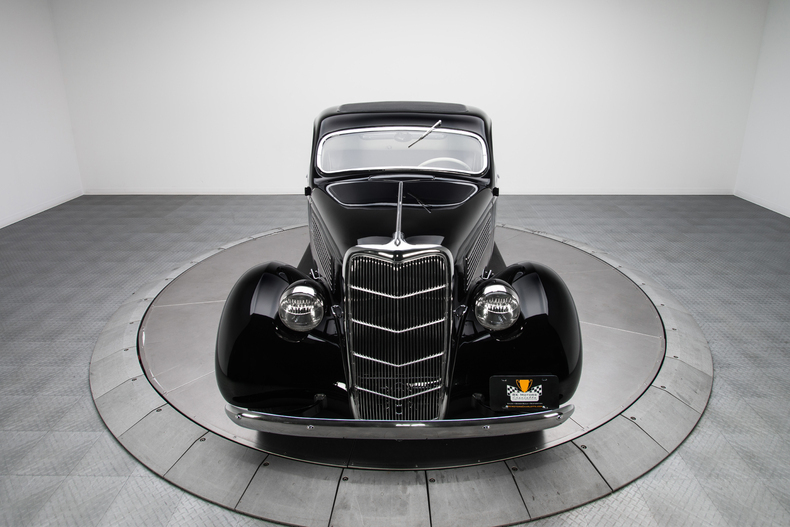 Well, we called it a "coupe" but the reality is this piece of historic Ford tin began as a '35 humpback sedan and turned into a coupe by Troy Ladd and his staff at Hollywood Hot Rods (HHR) in Burbank, California. 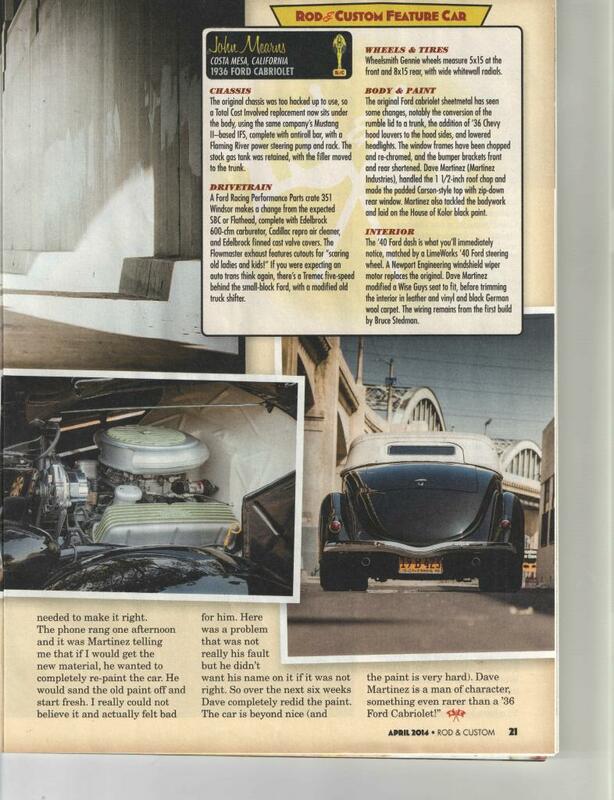 To get to this point, a great deal of effort and talent was pressed into service. 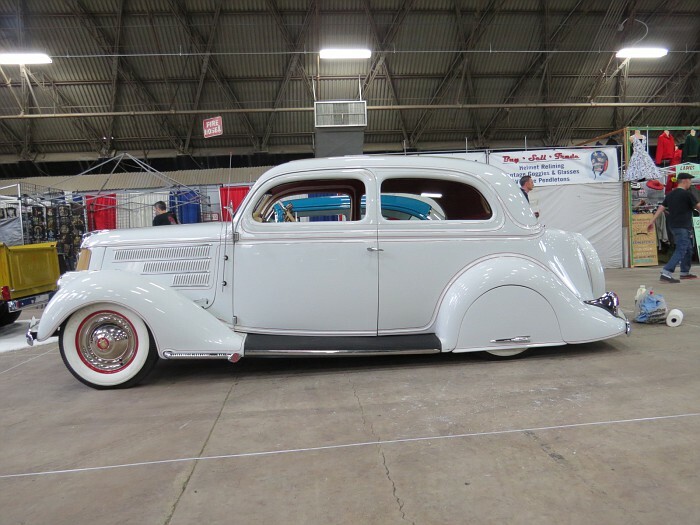 HHR began with the sedan body, chopping it 5 inches, fitting it with a fabricated steel roof insert, all the while retaining the sedan rear window, utilizing suicide sedan doors along with custom sweeping window frames. 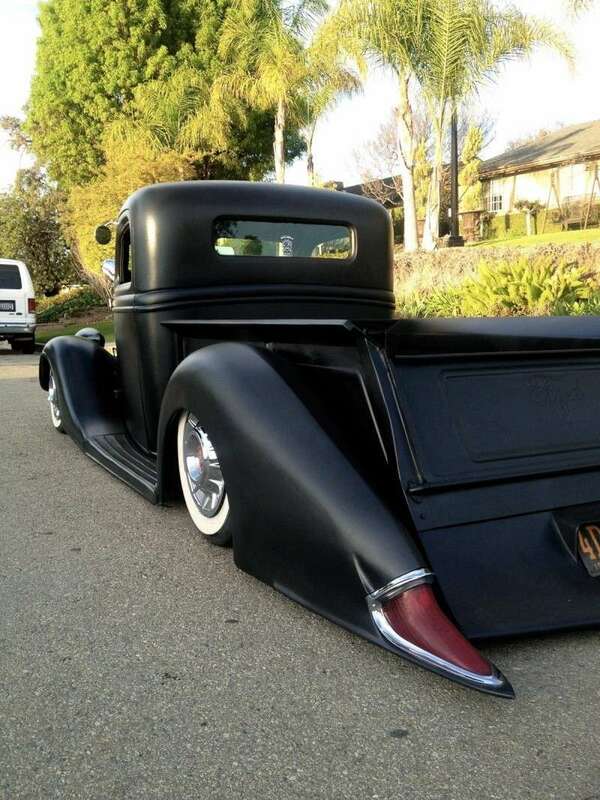 Look closely at the lower door body line and you'll see that it "flows" into the custom-fabricated rocker panels. 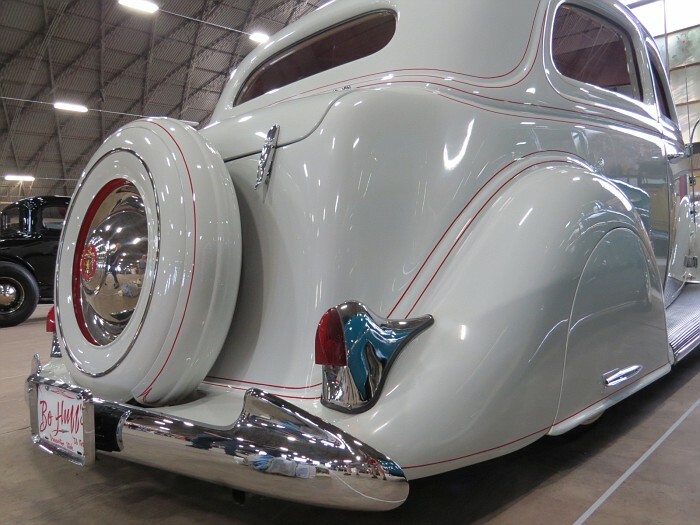 The sharp non-symmetrical peak rear fenders are custom, pontoon style, extended 8 inches, and filled with fabricated-full cover fender skirts. 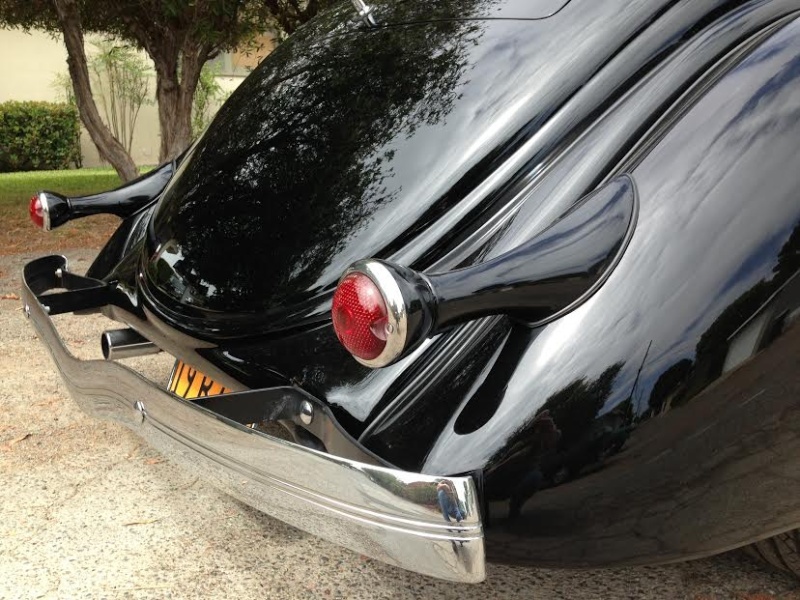 The rear section of the car is extended 6 inches and outfitted with '46 Hudson taillights, integrated into a custom rear rolled pan. 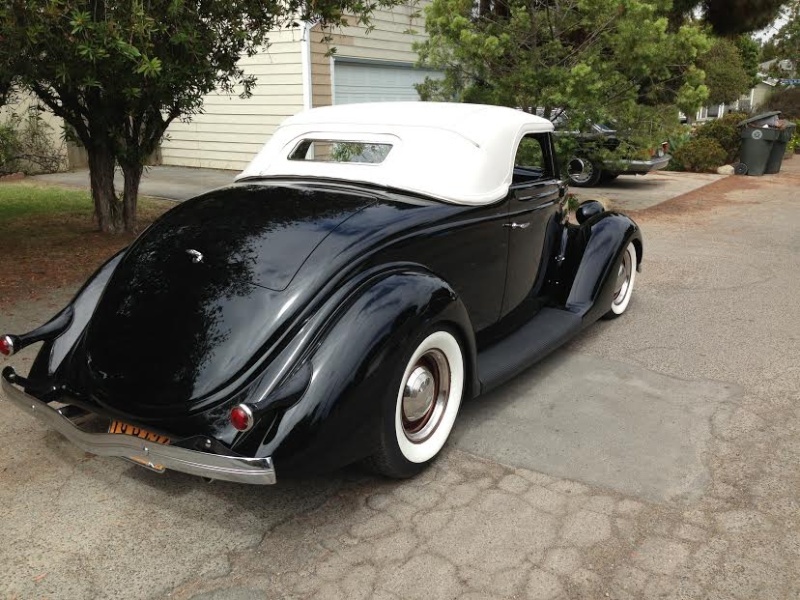 More custom work in back includes the fabricated rear bumper using '49 Merc bumper bullets, while resting between the rear fenders is an aluminum decklid made from a Bentley hood skin. 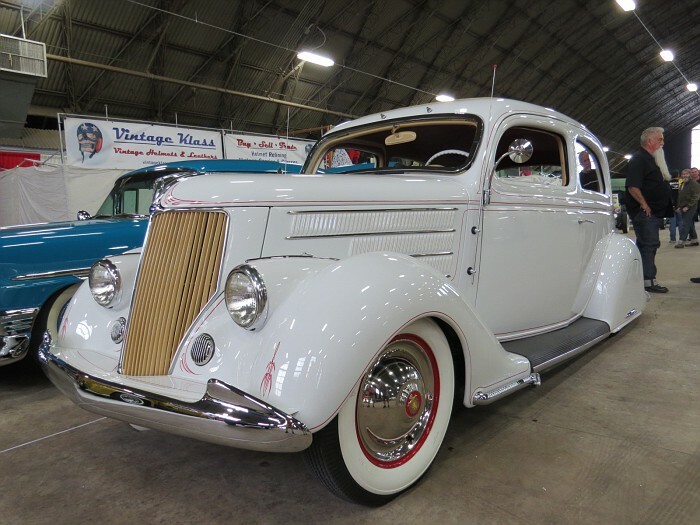 The front fenders also fell into the custom-fabricated category beginning their life as '35 Plymouth fronts with a peak added along with integrated contoured running boards and horizontal joints. 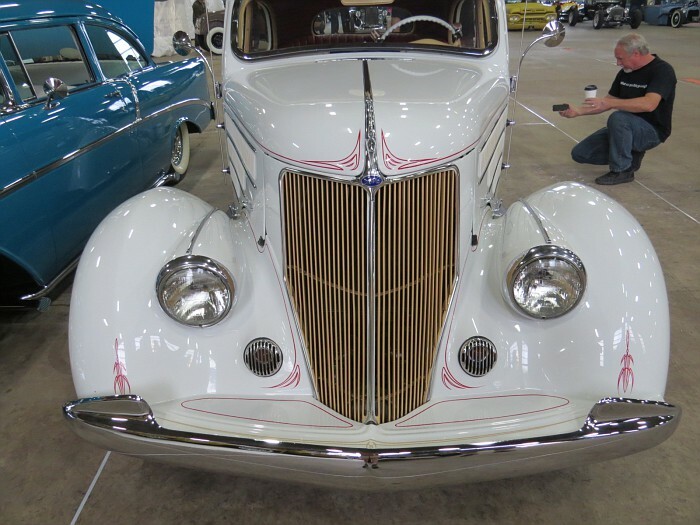 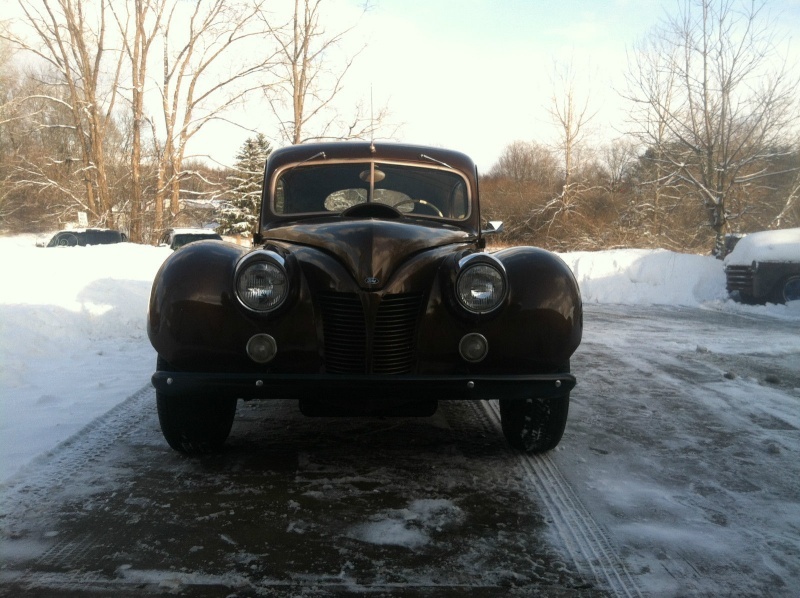 The headlights started as '41 Chevy truck buckets but were neatly molded into the fenders. 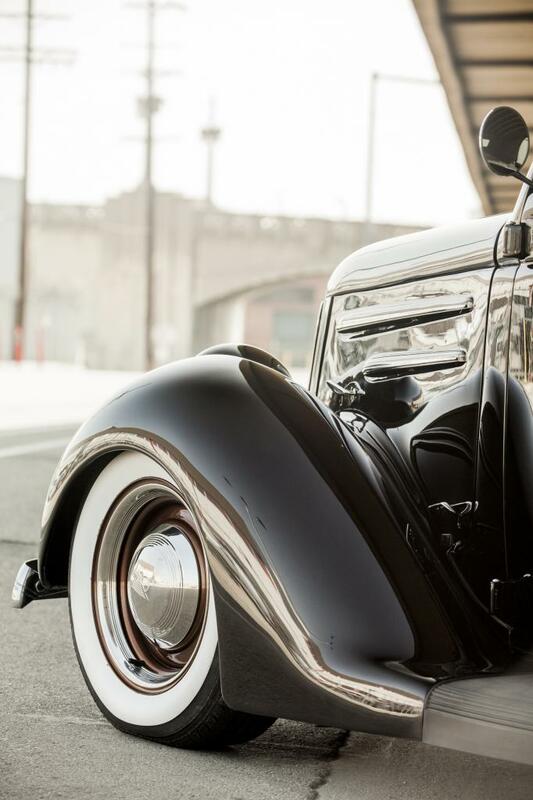 Resting directly between the front fenders is a '41 white commercial truck grille with a handmade stainless surround and a custom hood featuring a peaked crown and handmade sides resurrecting '35 Ford louvers. 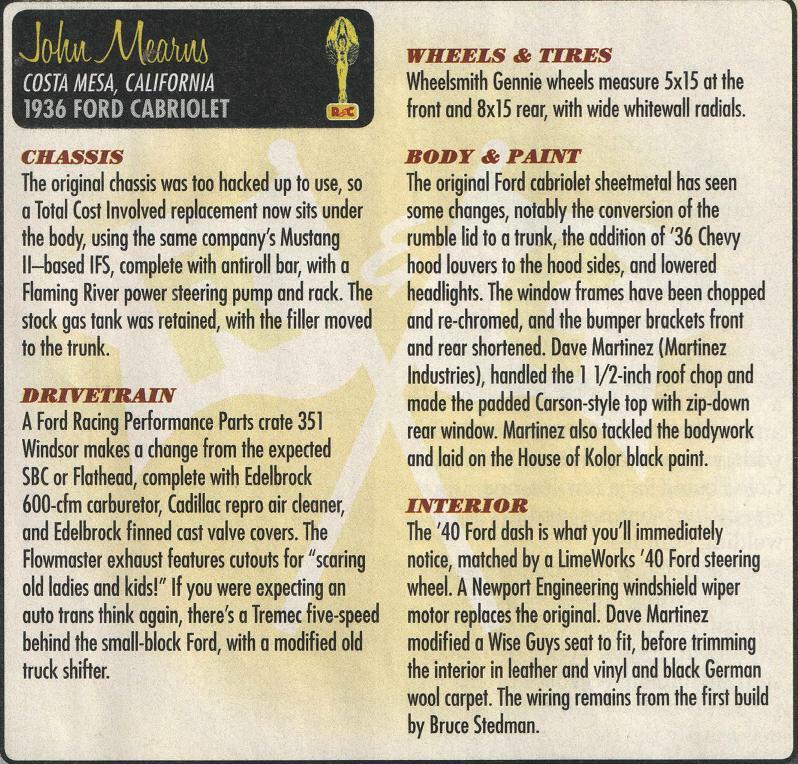 All the HHR massaged sheetmetal was then taken to John Harb and his crew at The Shop (Los Angeles) for one final bit of bodywork and then painted in a PPG Cherry Amber Red. 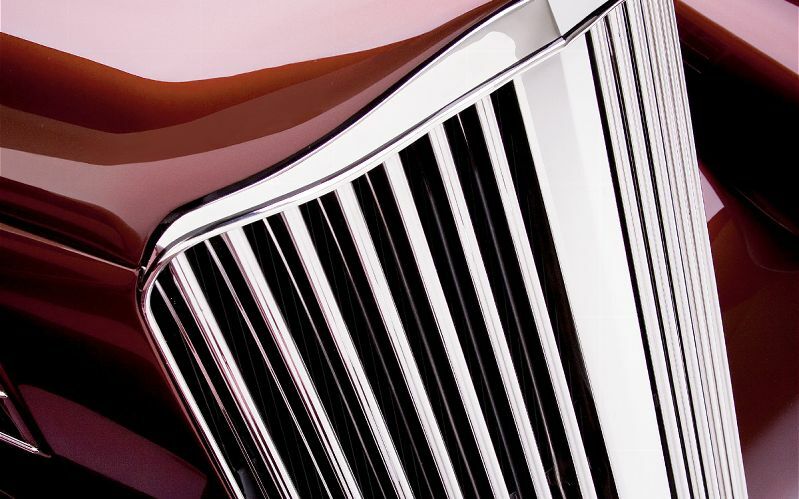 All this massaged and painted sheetmetal rests on a Fatman Fabrications (Charlotte, North Carolina) chassis featuring an independent front suspension, power rack-and-pinion, Firestone airbags utilizing an Air Lift digital air suspension, KYB shocks, and drum brakes linked to a dual reservoir master cylinder with a power booster. 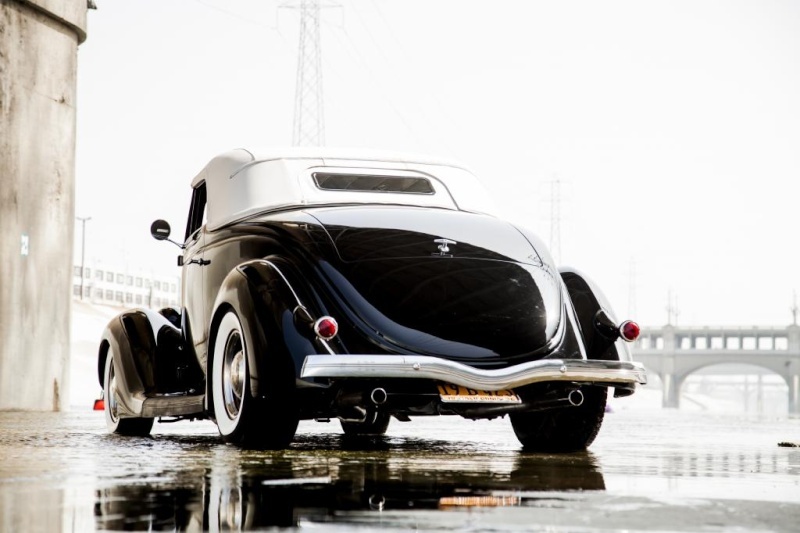 The rear suspension is again a combination of Air Lift, Firestone, and KYB linked to a triangulated four-bar built around a Ford 9-inch with 3.08 gears. 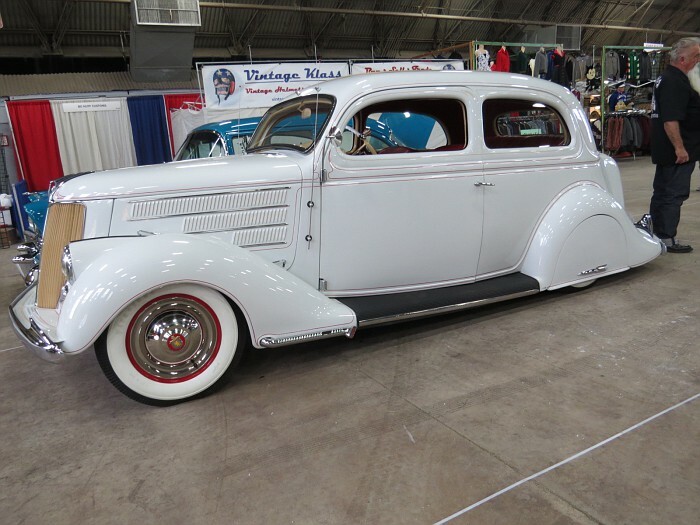 More corner items include Wheelsmith Smoothies, measuring 15x6, wrapped with Coker radial wide whites, and dressed with '41 Studebaker caps. 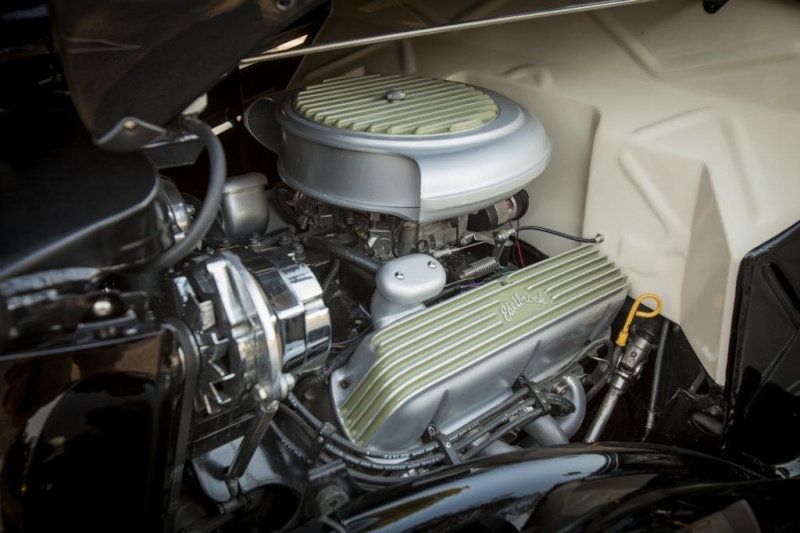 The engine is the hot rod workhorse in the small-block Chevy crate motor with an Edelbrock intake, 650-cfm four-barrel, and finned air cleaner and valve covers. 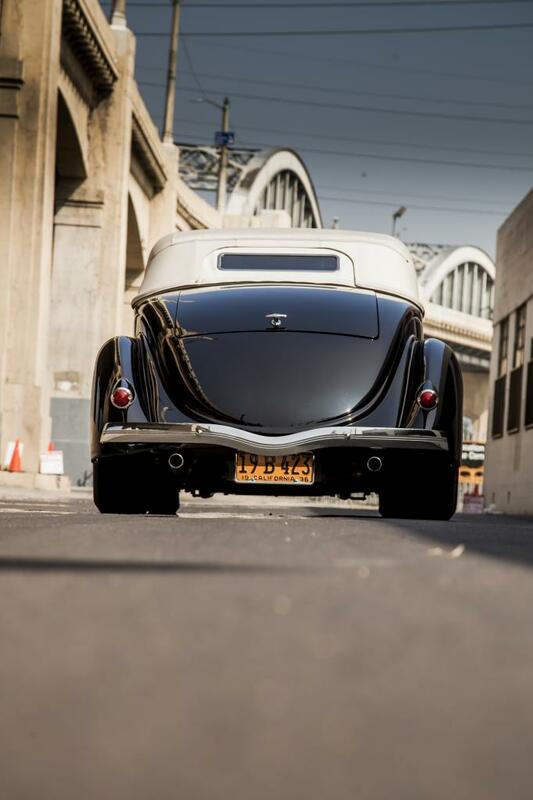 An HEI ignition is retained along with block hugger headers and 21/2-inch exhaust system and turbo mufflers. 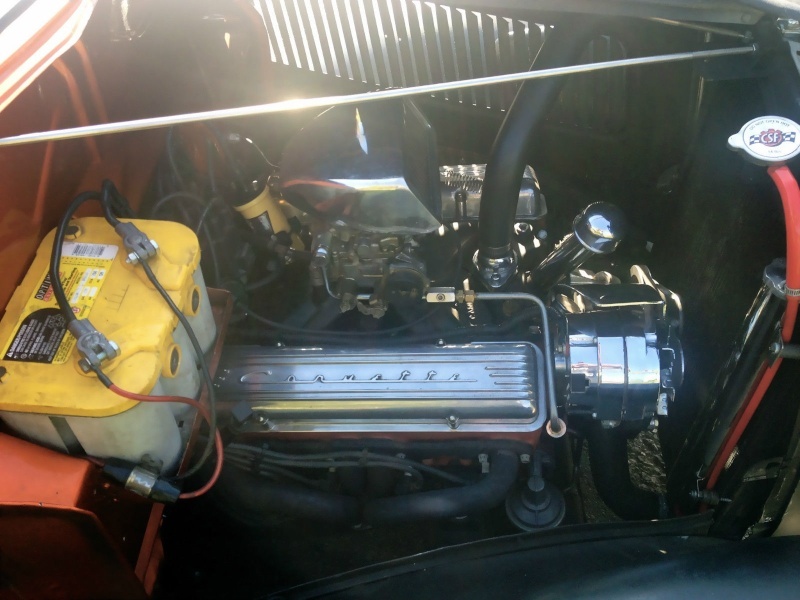 Hooked to the small-block is a 700-R4 prepped by Transition (Sun Valley, California), equipped with a Gennie (Denver) shifter and linked to an Inland Empire Driveline driveshaft (Ontario, California). 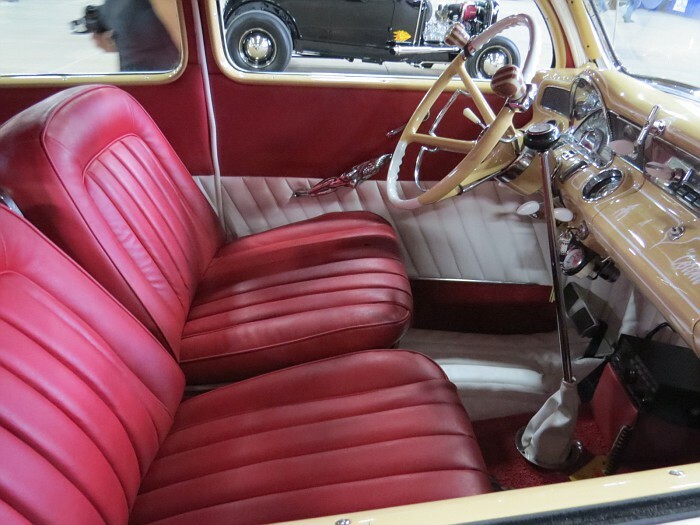 Bugs wanted to have a hand in his hot rod, so the well-known tattoo artist made his artistic talents visible throughout the interior. 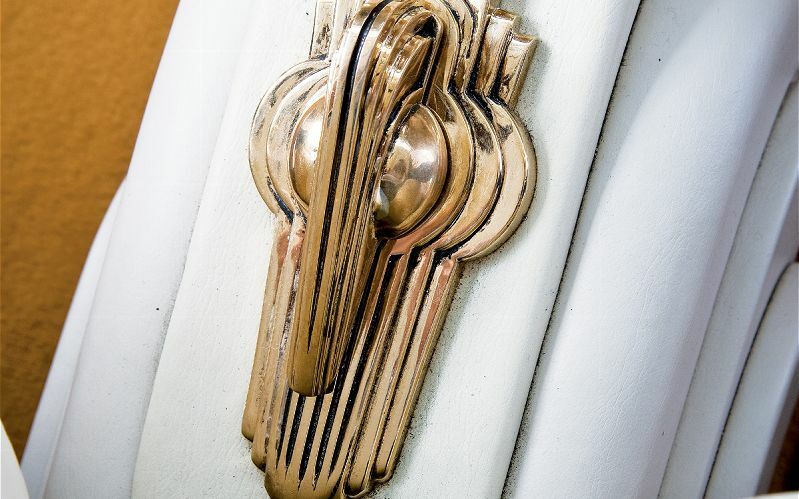 The art-deco design and renderings came directly from his mind to his pen and through his hands yielding the one-of-a-kind art-deco dash knobs, center console, ignition bezel, and key. 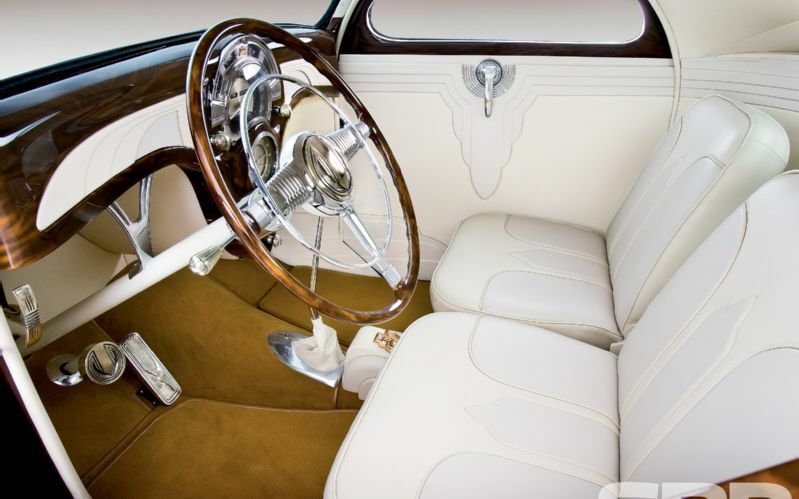 The '46 Pontiac steering wheel features a matching horn button matching the custom brake pedal, shift knob, and handles all made by Bugs. 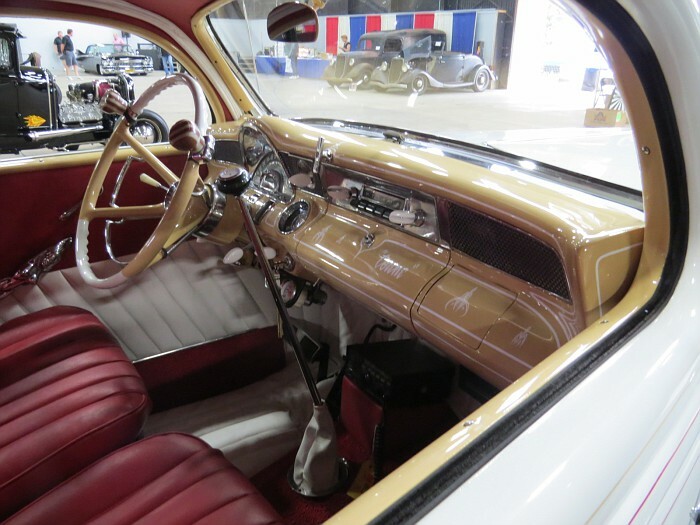 Other interior appointments include the custom-fabricated one-off steel dash by HHR while the gauge cluster is a restored early Chrysler with a '41 Mercury clock. 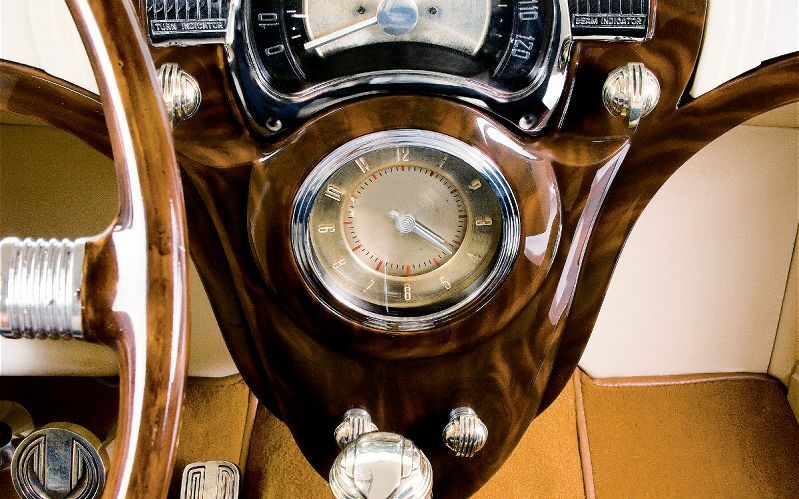 The dash and garnish molding was painted in a woodgrain pattern by Jon Harb. 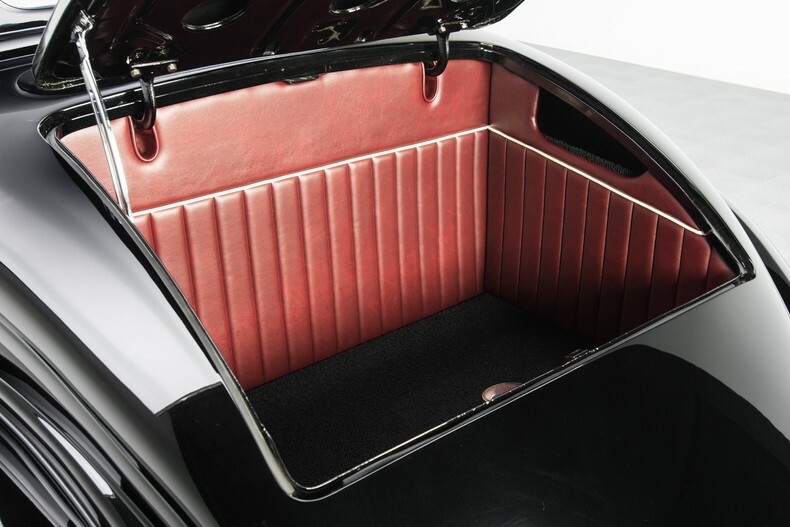 The interior stitch work was handled by Dave Martinez, of Martinez Custom Upholstery (Burbank, California), and covers early Mustang buckets in Ultraleather. 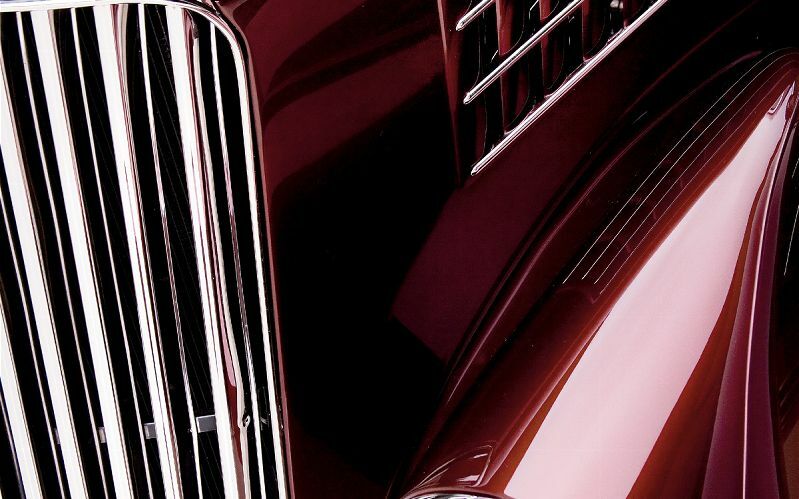 This custom coupe will most definitely stand the test of time bringing the best of a bygone era forward and coupling with today's craftsmanship. 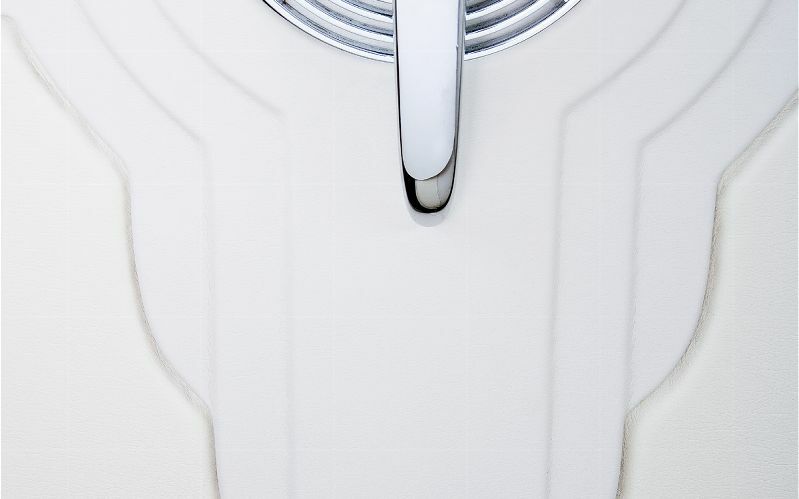 Rappelons quand même que sur cette voiture, Troy Ladd n'a pas touché 1 seul boulon, c'est Christophe, un Français qui bossait chez Troy à cette époque qui s'est tapé toutes le boulot de tôlerie. 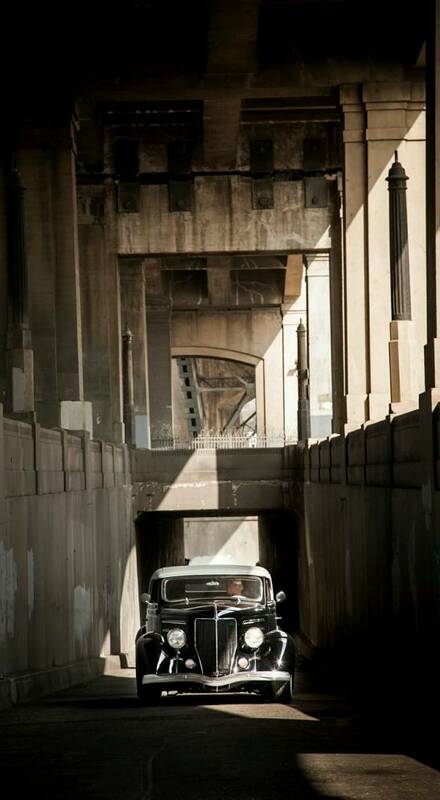 6 Ford tudor slantback sedan owned and restyled by Bo Huff of Bo Huff Customs in Dragertown, Utah. 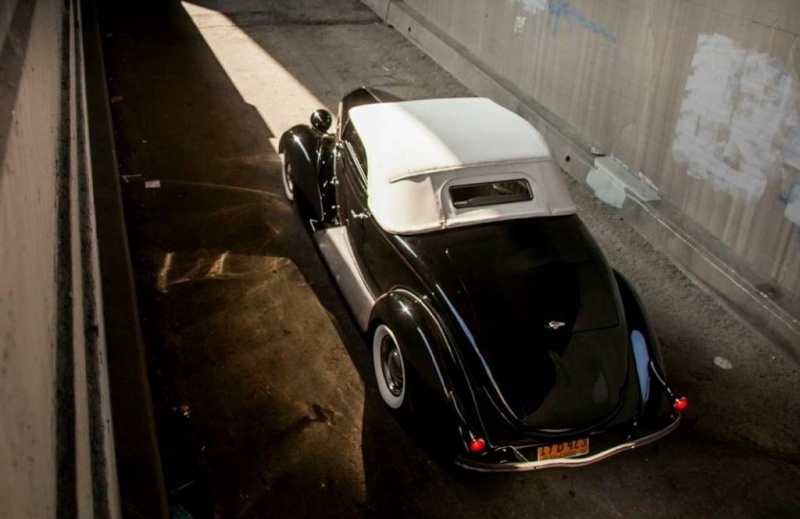 The car, named Corene, was completed in 2013. 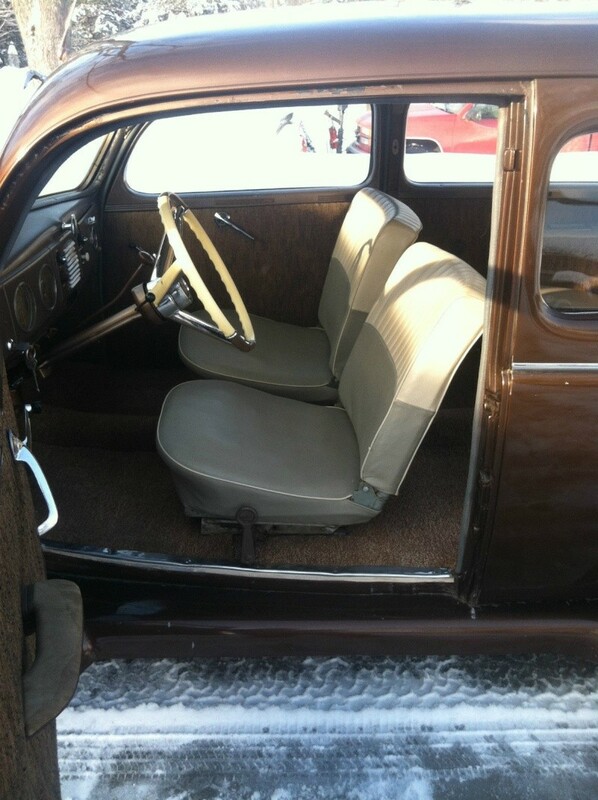 1938 Ford 2 door Sedan. 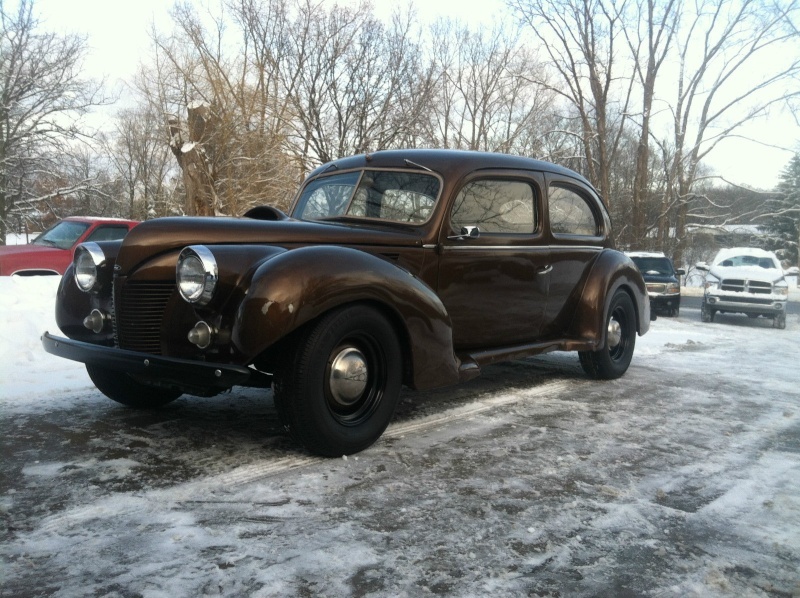 This car was bought back in 1940 and was owned up till about 3 months ago. 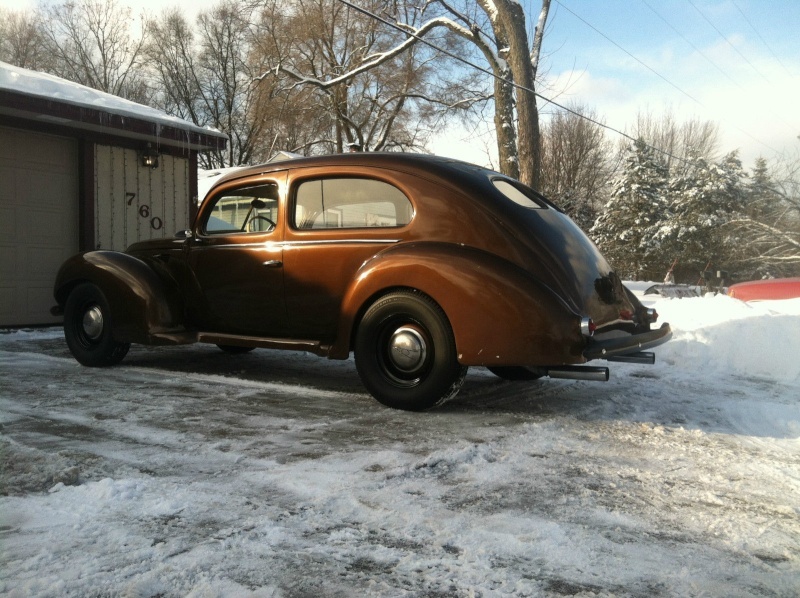 Sadly the original owner passed away and his family did not want the car, so I bought the car. 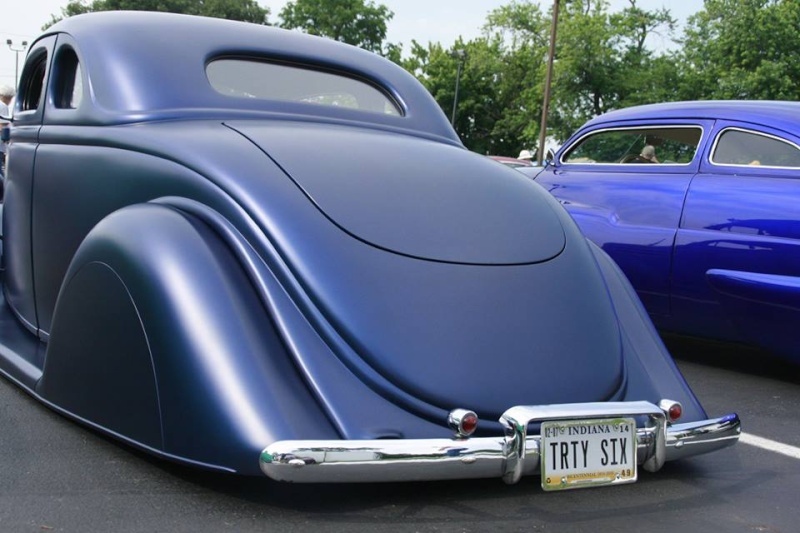 This is a true custom from the 50's. 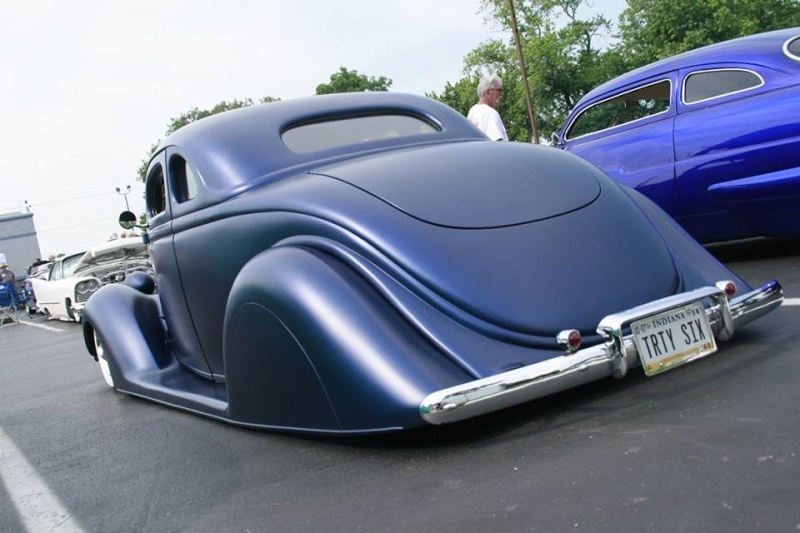 The body was chopped not the top. 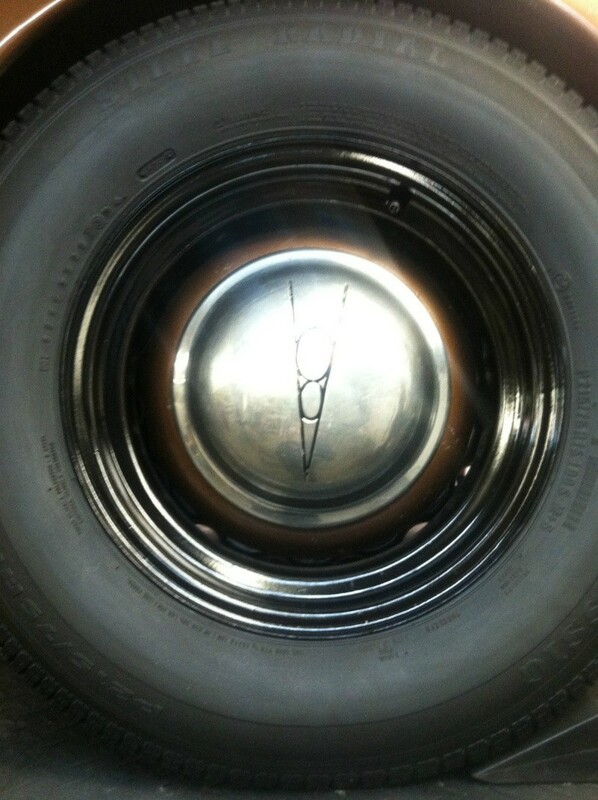 Everything was done with metal, lead, and braze. 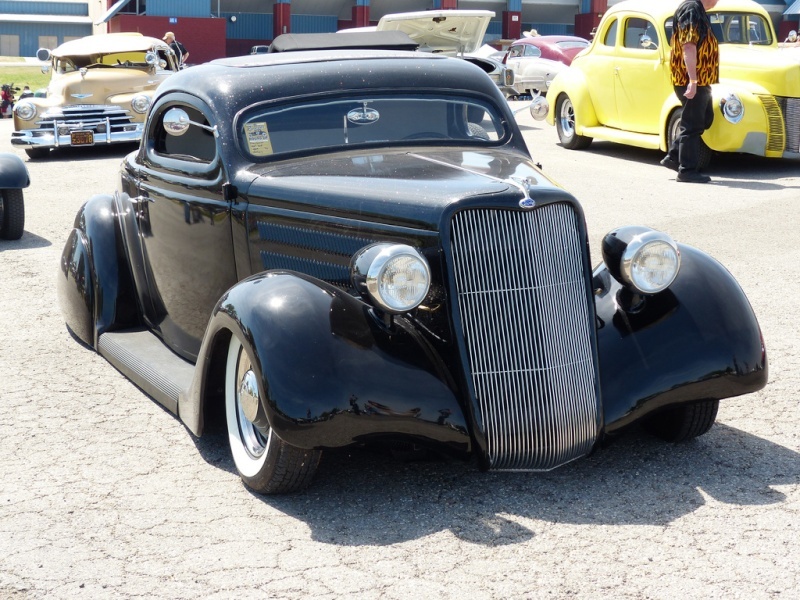 Some of the custom touches include the headlights, tail lights, wheels ( car came with 16's the owner cut the centers out and re-welded them into 15's), the body was chopped and the fender were brought up on the body instead of cutting them. 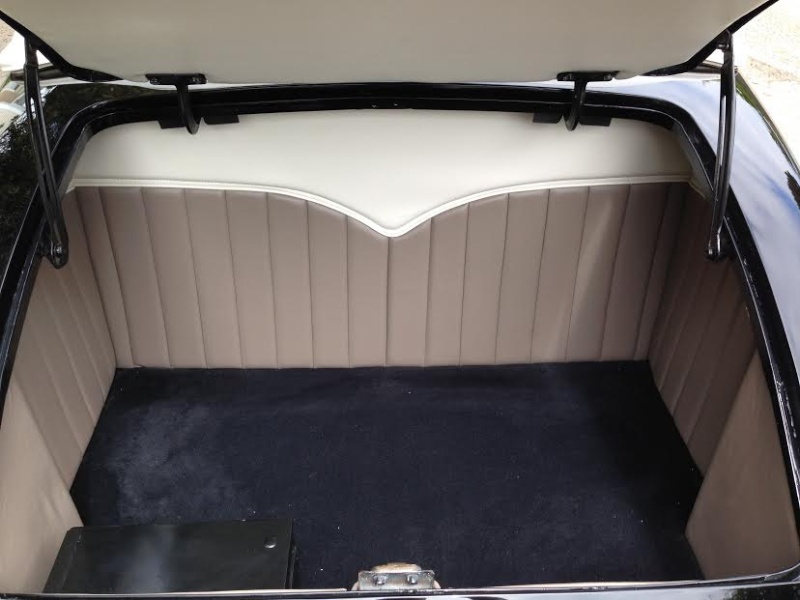 The trunk was shaved in but is still accessible though back seat. 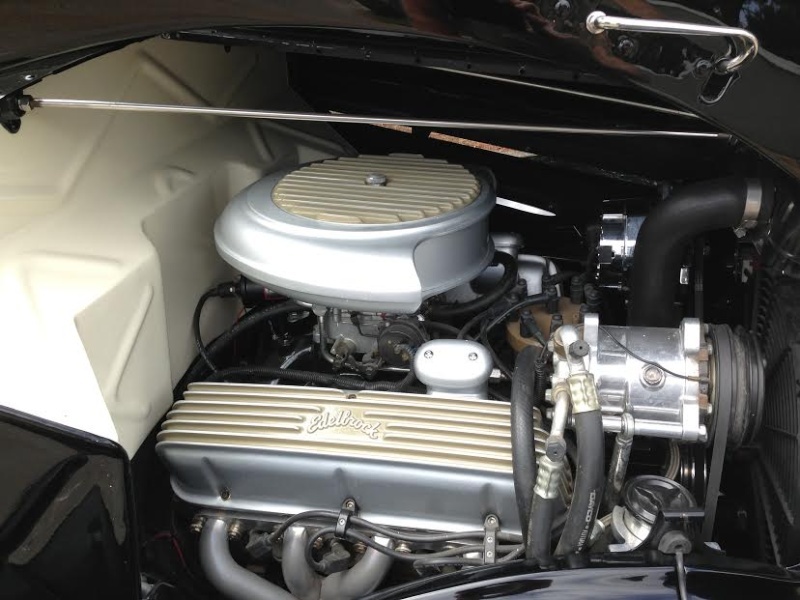 Under the hood is the stock Flat head ford with 3 speed manual transmission. 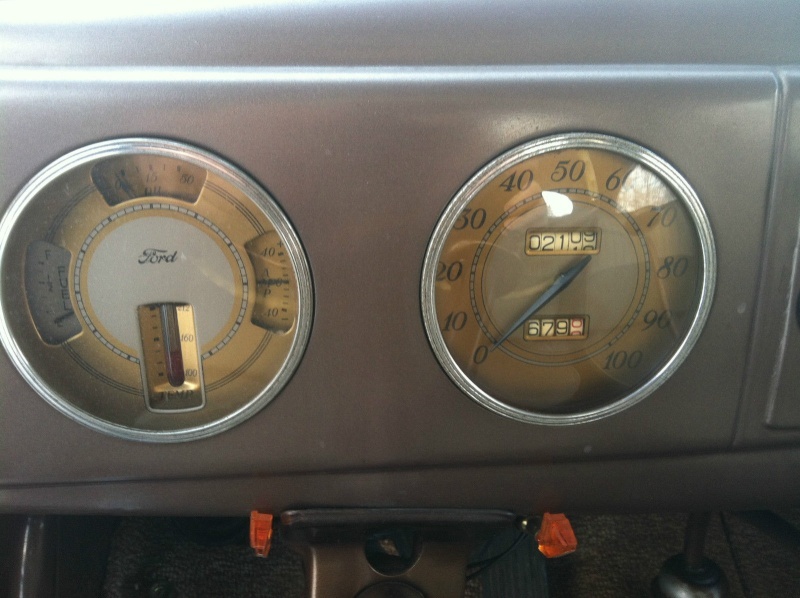 The electrical system is still the stock 6 volt and works great. 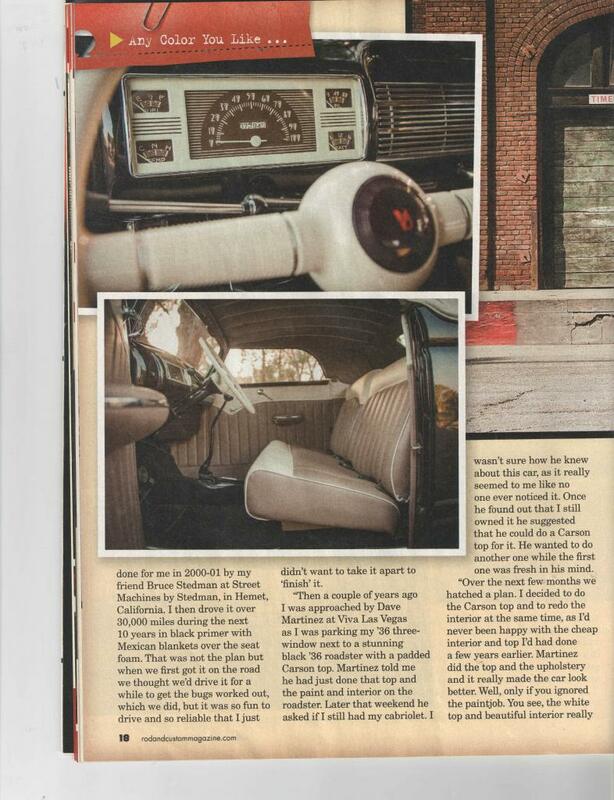 This is a running and driving car. 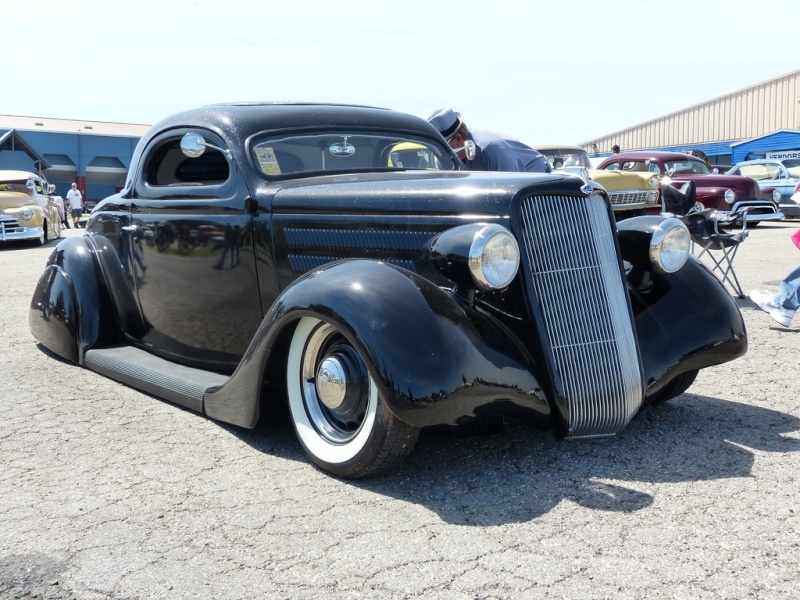 When it comes to old school Fords, the world has plenty of street rods especially late thirties and early forties offerings. 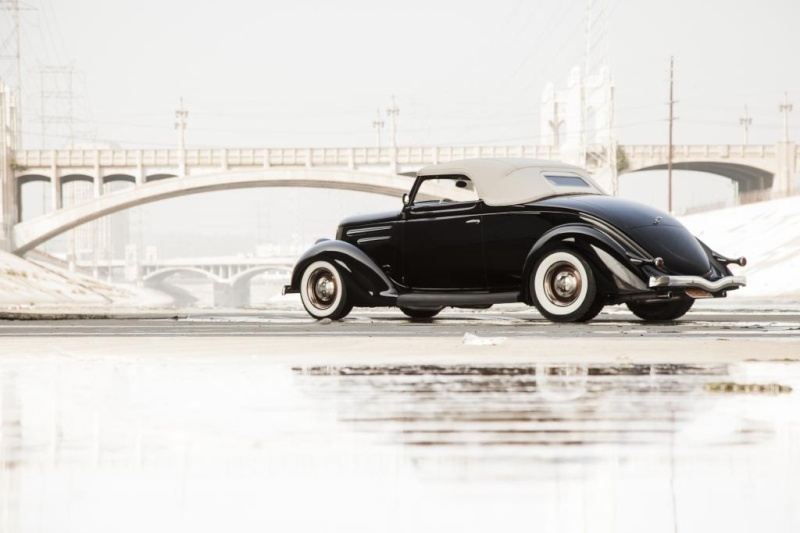 But for every Henry Ford original that's gifted a Mustang II front clip and small block Chevy, the initial appeal that drove buyers into showrooms drifts one page further into history. 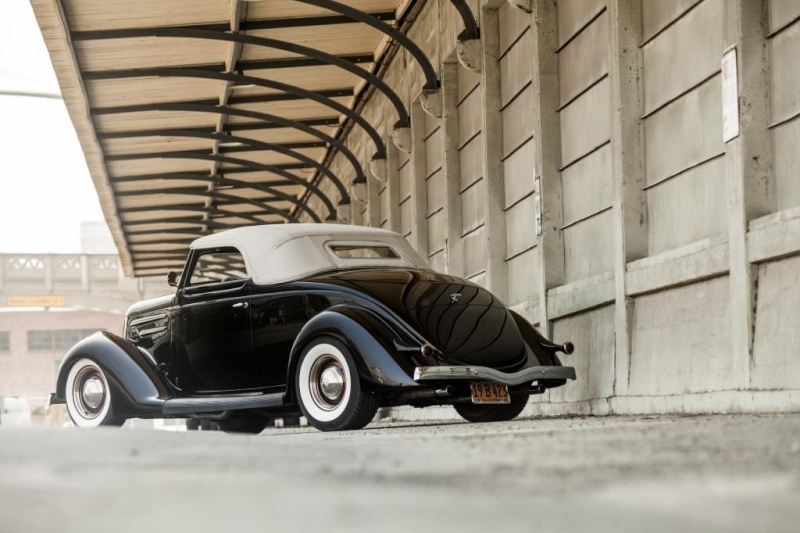 Thankfully, there are still cars like this stunning '35 3-window that remind us just how great these classics were in all their era-correct glory. 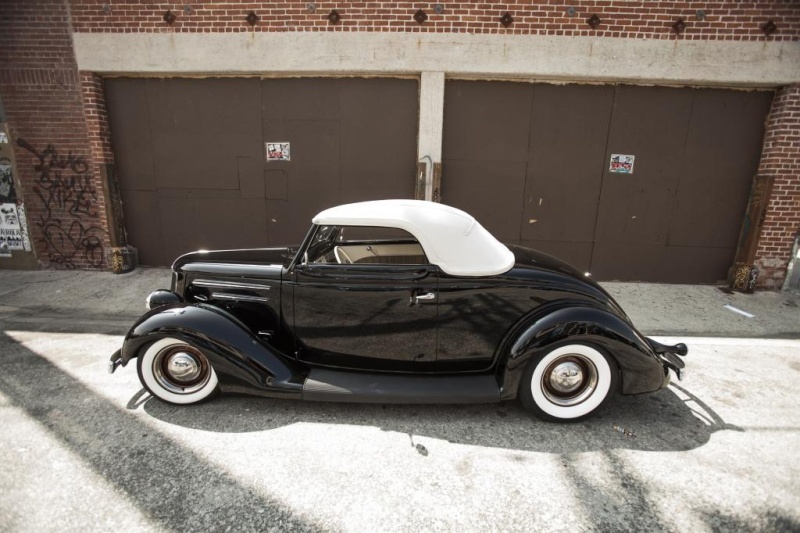 Powered by a legendary flathead, backed by a rugged 3-speed and dressed in traditional Ford Black, this former Rod & Custom feature epitomizes vintage American elegance. 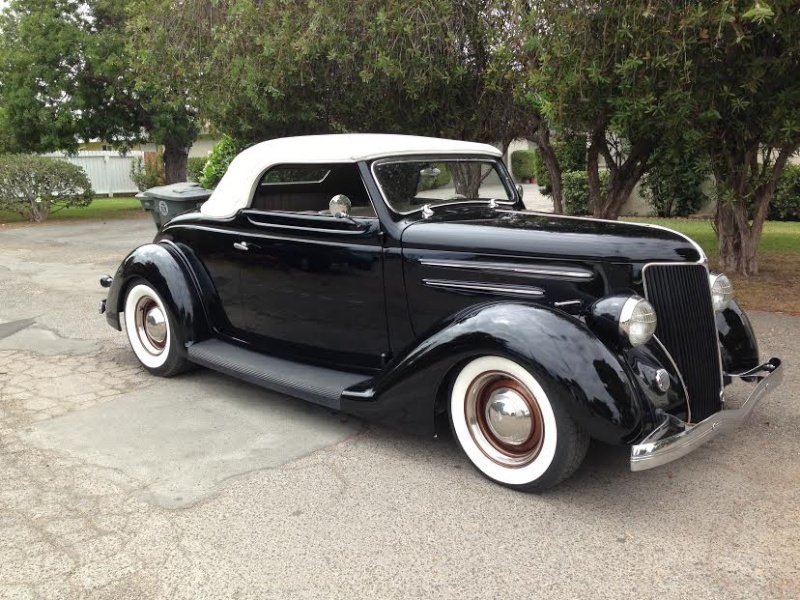 And if you're looking for a near-perfect cruiser that puts a new shine on pre-war ambition, they simply don't get nicer! 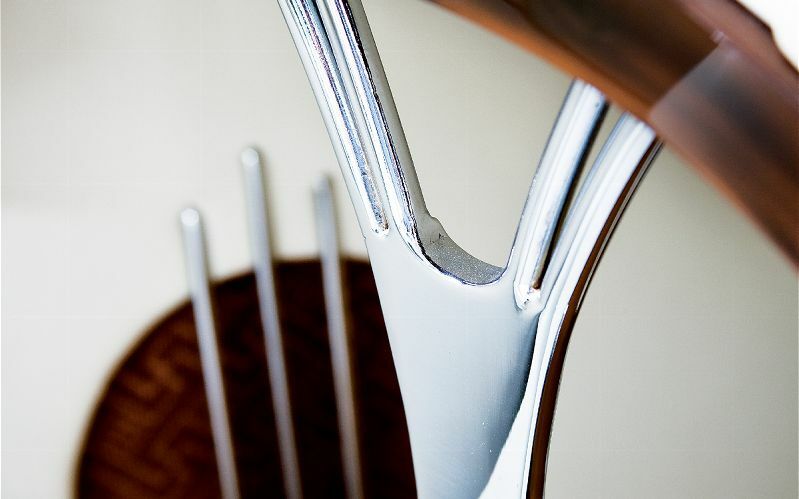 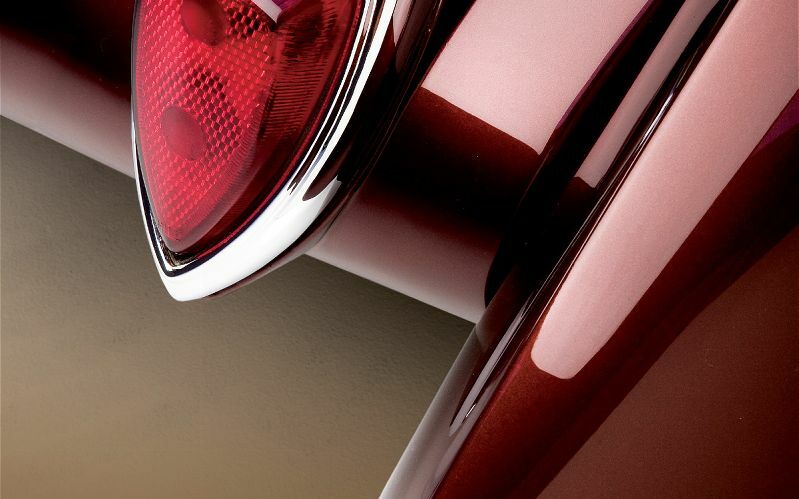 Approaching this sleek beauty, it's difficult not to be taken with its killer profile. 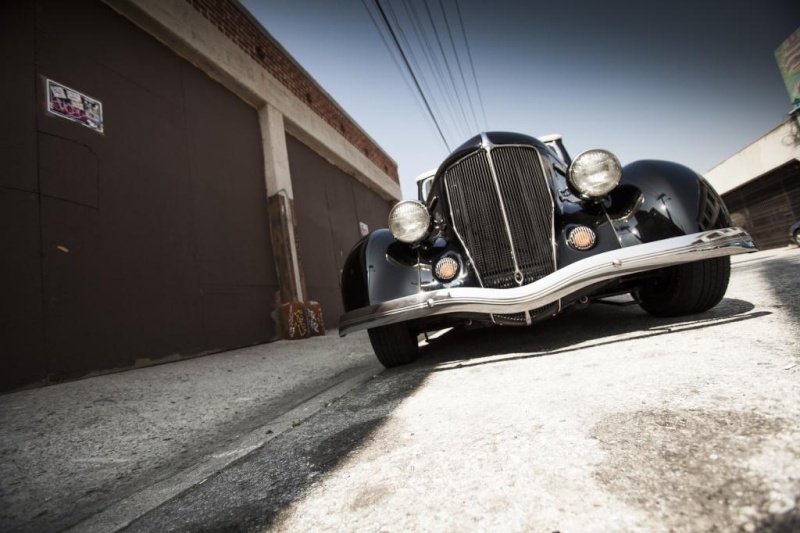 Josh Mills of Mills & Co., the man who originally envisioned the car, wanted to build a period-perfect 'prototype' of something James Cagney might drive in a well-done Film Noir. 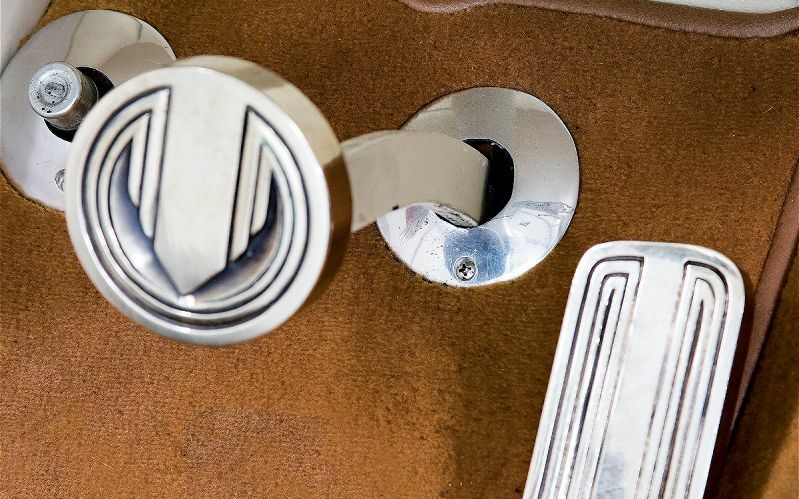 To achieve that lofty goal, he needed a solid profile that could benefit from very specific metalwork. 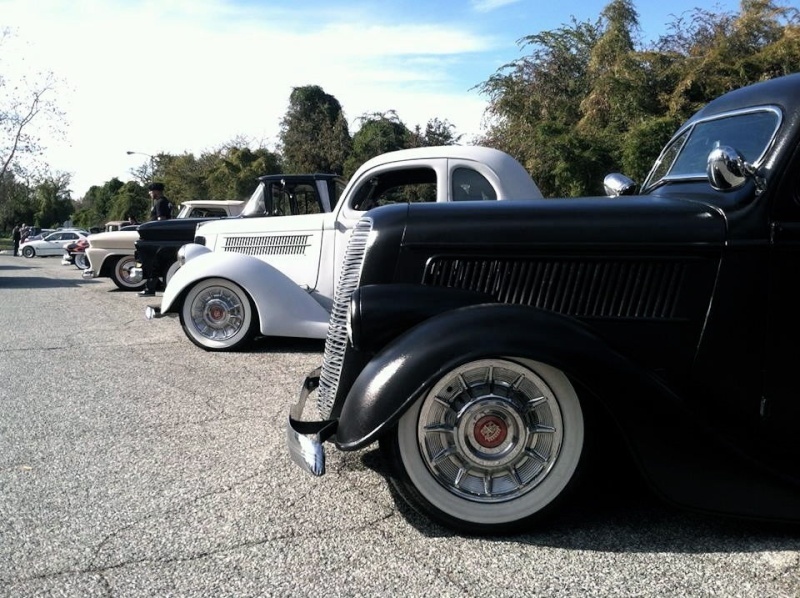 Josh's journey began with a trip to the 2005 Charlotte Auto Fair where he found two '35 3-window coupes advertised on a small bulletin board. 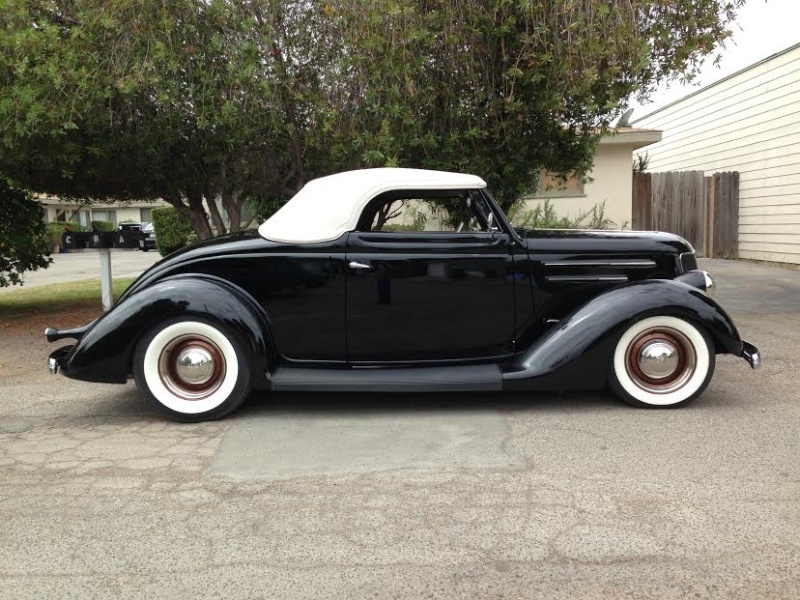 Initially buying one of the coupes, Josh eventually ended up with both thanks to an anxious seller. 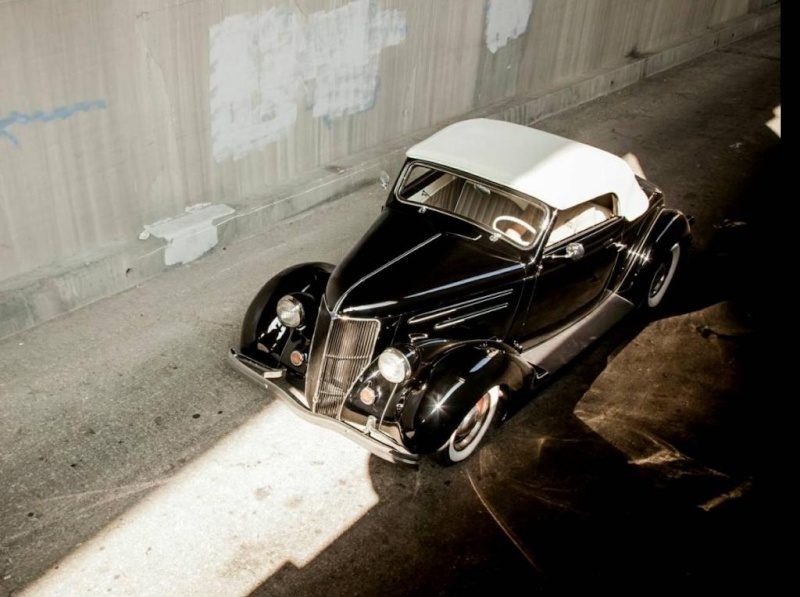 Because he wanted to do a chop, Josh sold the first, unaltered car in favor of a botched roof job on the second car. 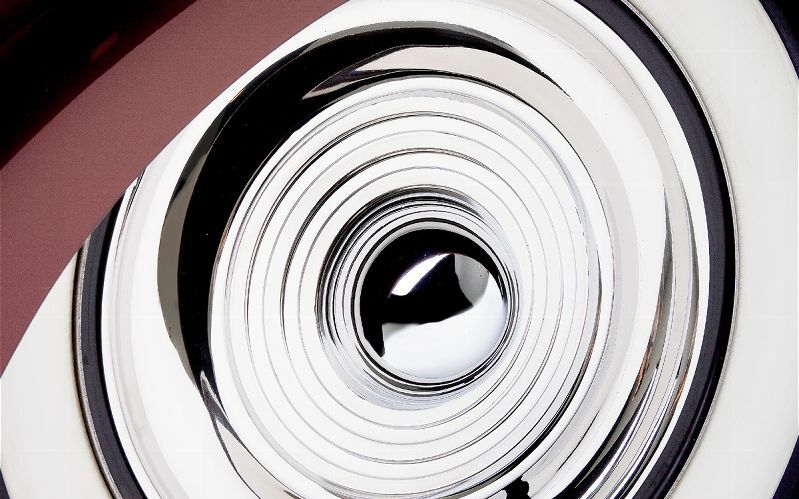 The next three years would be spent sourcing era-correct parts. 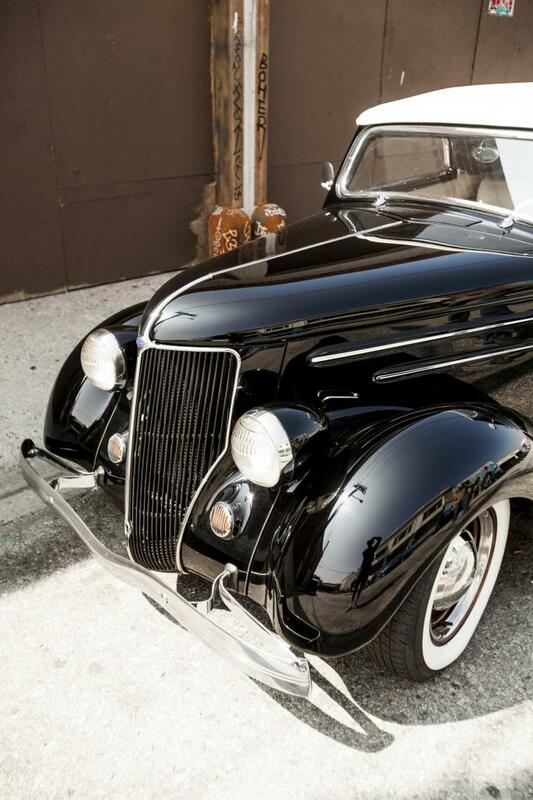 And, after thoroughly massaging the coupe's Henry Ford steel, he shipped it to Customs and Color in Woodstock, Georgia for some of the best black two-stage on the planet! 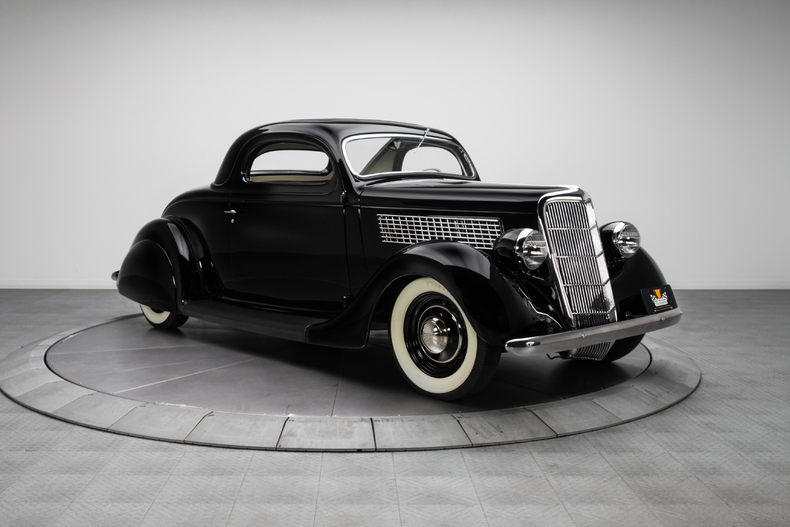 There really isn't much you can do to make a 30s-era Ford more attractive. 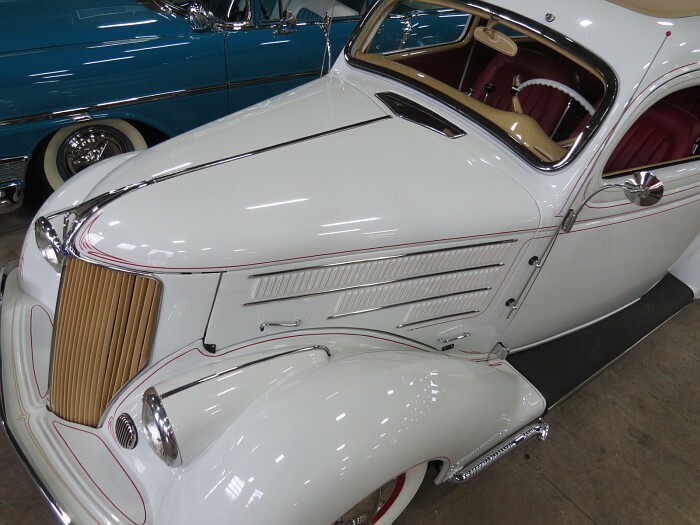 The car's streamlined styling was a home-run when originally introduced; and today, it's a stunning example of some of the strongest elements of the highly regarded Art Deco movement. 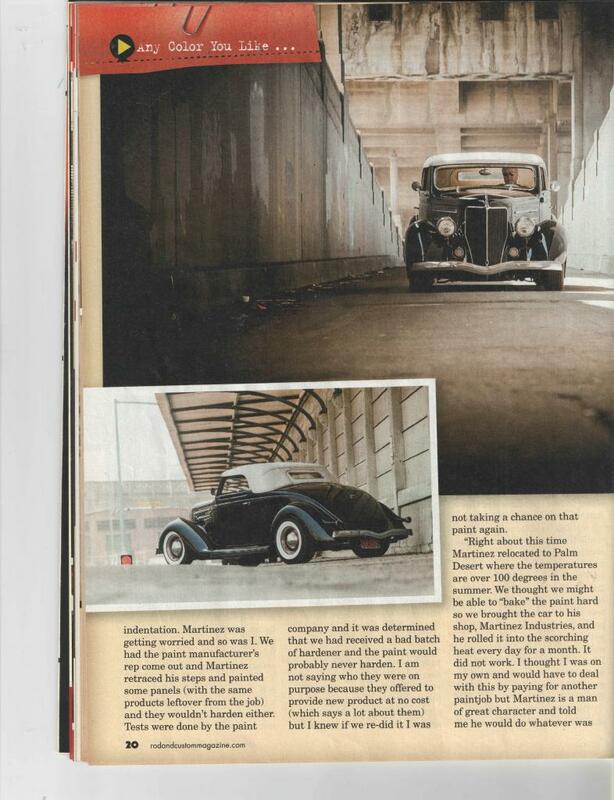 That said; Mills & Co. knew exactly how to take this 3-window from bankable B-lister to astonishing A-lister. 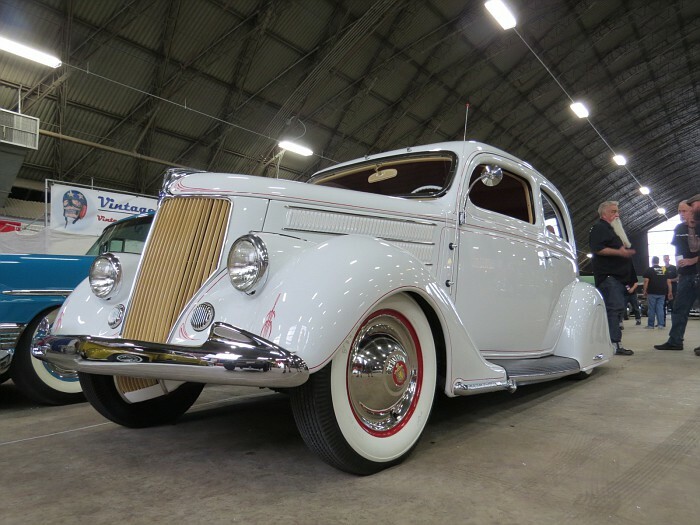 At the front of the car, a custom chrome grille, which hangs a filled top and custom bull nose above a peaked base, rides between relocated, '36 Ford headlights and a chrome '38 Ford bumper. 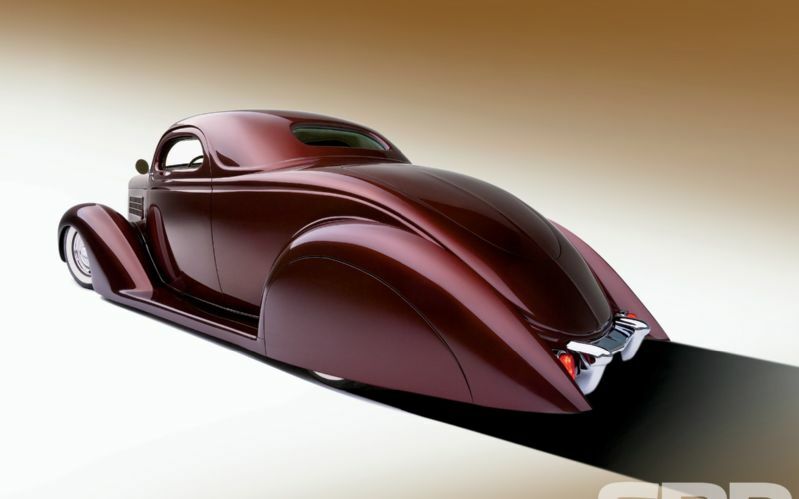 At the sides of that bumper, sculpted fenders rake past custom-trimmed air extractors and a smooth, folding hood. 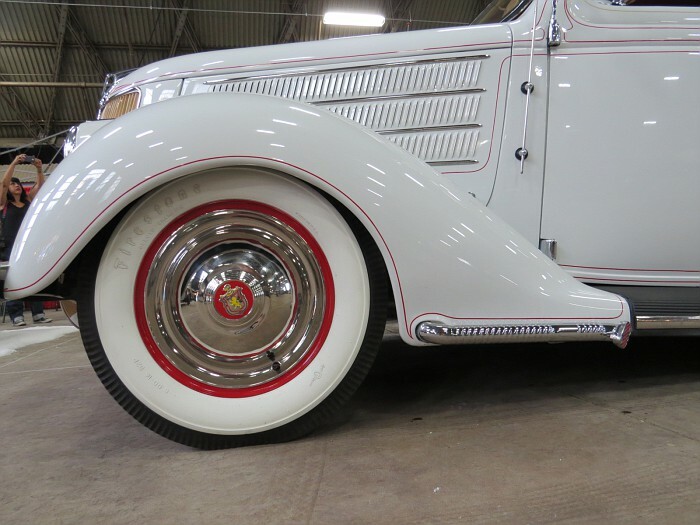 Behind those fenders, original, re-vulcanized running boards parallel old school bear claws and simple chrome handles. 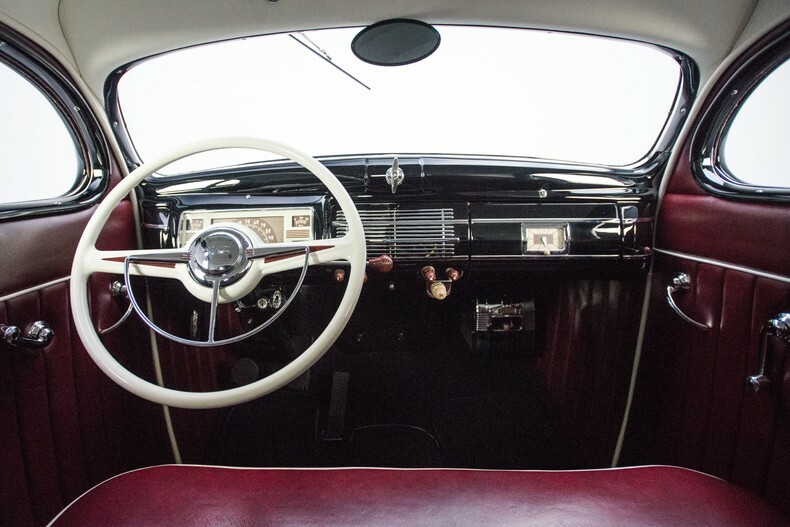 Opposite those boards, a small stainless wiper accents a '36 5-window insert channel, which balances a 2.5-inch chop in front of a 3-inch chop. 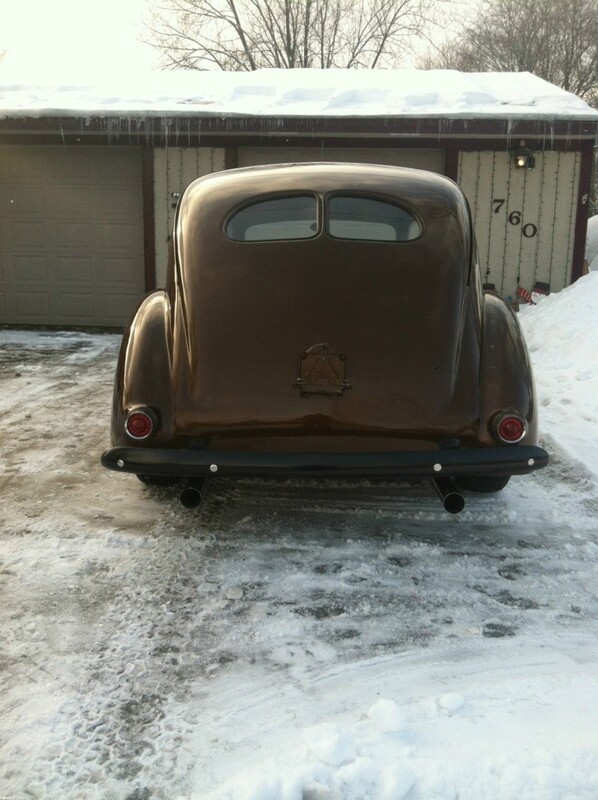 And opposite that wiper, a '35 Ford trunk hangs above modified '40 Ford skirts, frenched '39 Ford tail lights and a second '38 Ford bumper that's fitted with a '41 Ford grille guard. 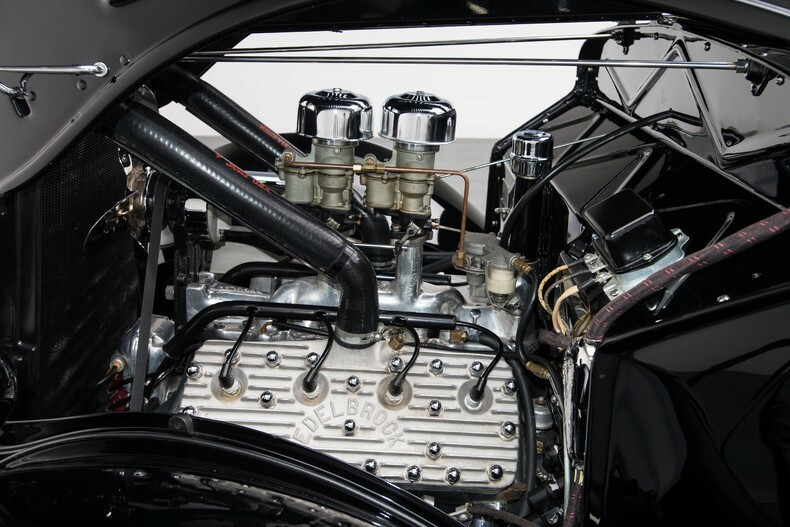 As the company's final Henry Ford-fueled innovation, the Ford V8 remains a durable, torque-rich powerplant that, thanks to solid engineering, has established an unmatched reputation in the classic and custom car community. 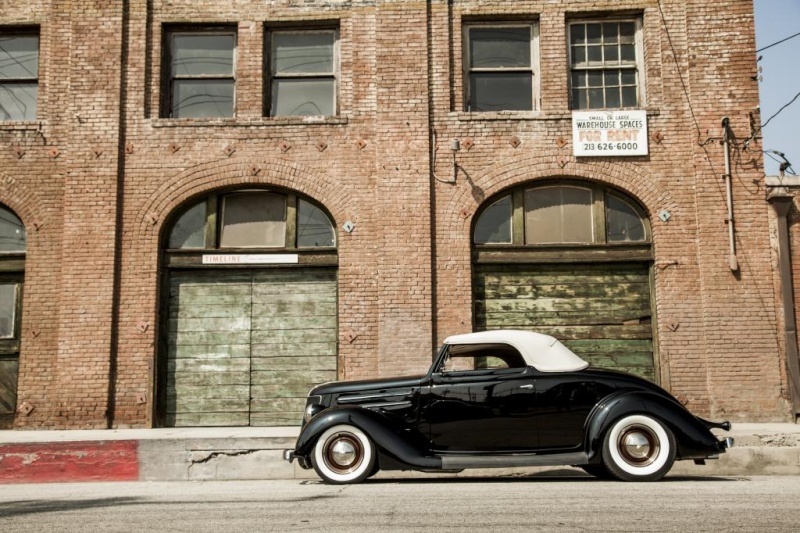 And, in keeping with hot rod tradition, this stellar Ford coupe is powered by a 284 cubic inch 59L flathead. 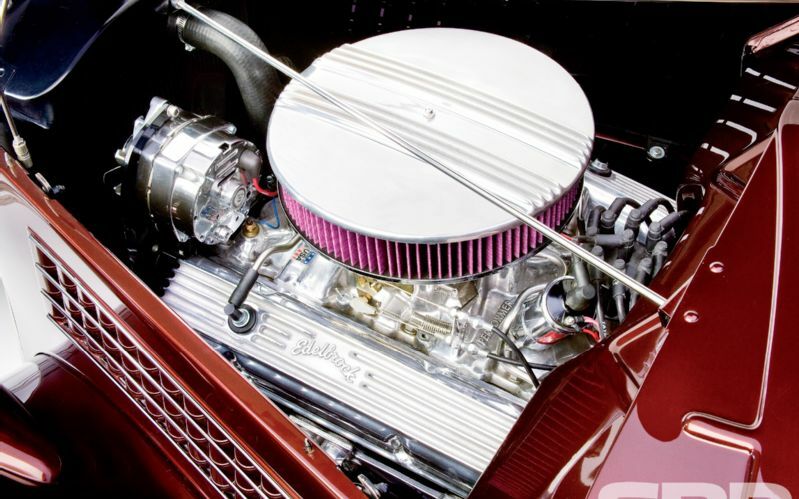 Born in 1946, and machined and balanced by legend Putt Smith, the throaty mill growls with the help of a roster of vintage parts that includes an NOS Johnson valvetrain, NOS 81A rods and a Don Zig-prepped Harman & Collins Magneto. 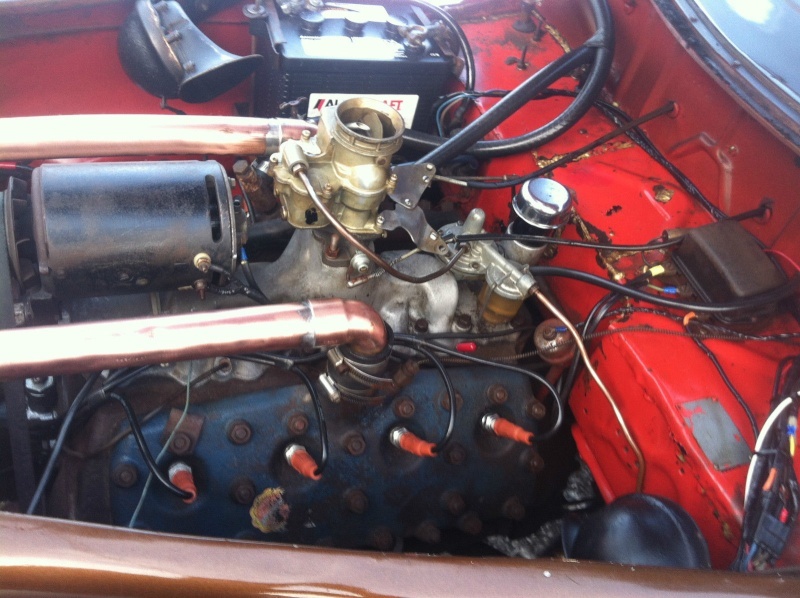 Fuel and air enter through a polished Edelbrock intake and, aided by a Mercury crank, a Winfield SU-1A cam and NOS Johnson lifters, exit through polished Fenton headers. 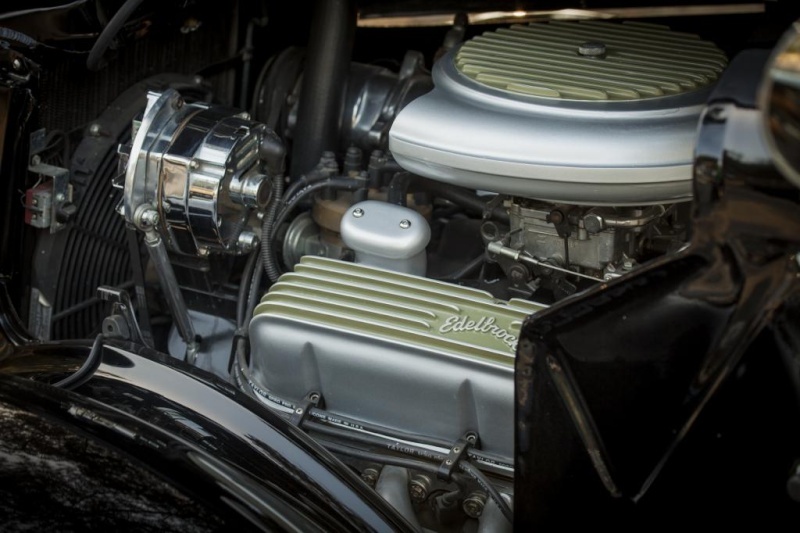 Aesthetically, the block, which perches elegant air cleaners and dual 94 carburetors above aluminum Edelbrock heads, has been painted a traditionally dark hue. 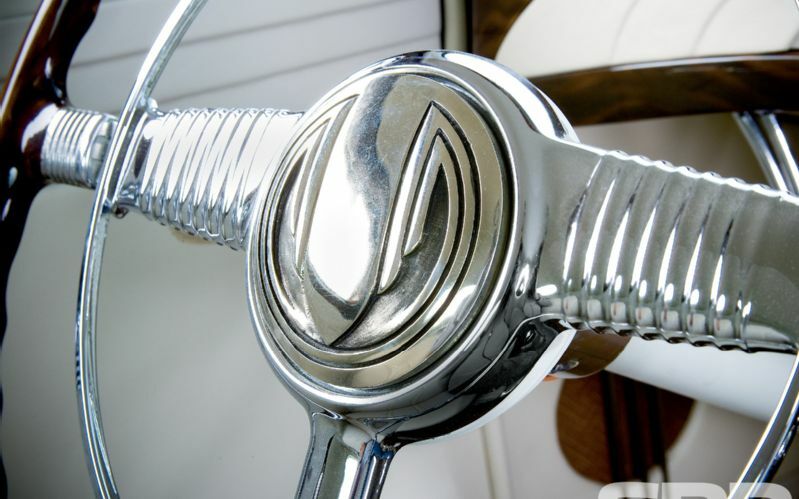 Cool details like a chrome generator, a chrome fan and reproduction Ford hoses add enough shine to win the show. 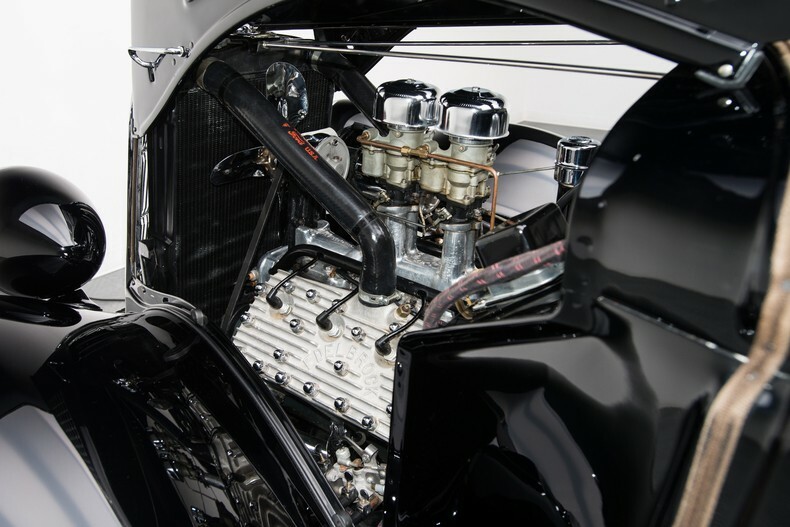 And overall, this custom's super smooth engine bay is a charming and 100% functional step back into a much simpler, and some would say better, period of American automotive history. 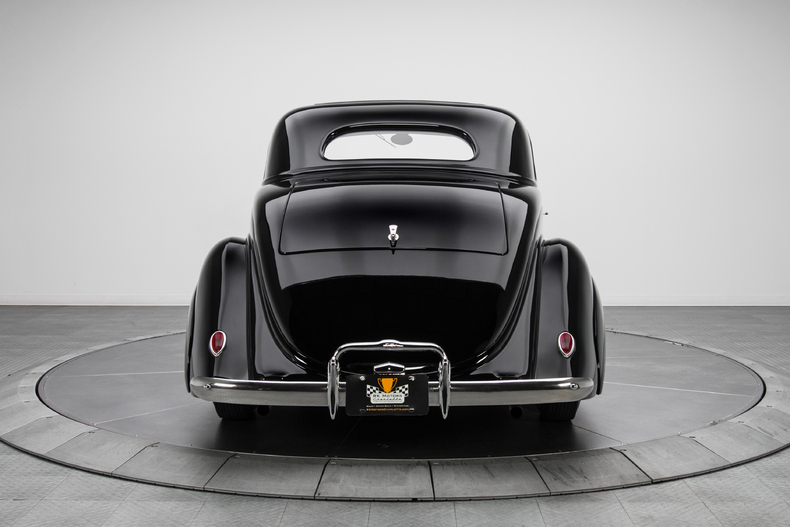 Speaking of simpler times, take one look under this reliable Ford chop-top and you'll see just how much the automotive world has changed. 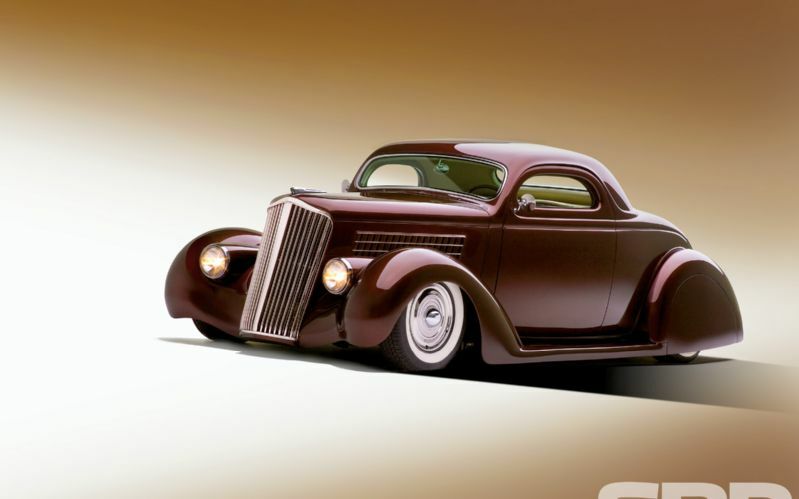 But that's exactly the way it's supposed to be as Mills wanted this coupe to feel like a true, period-perfect hot rod. 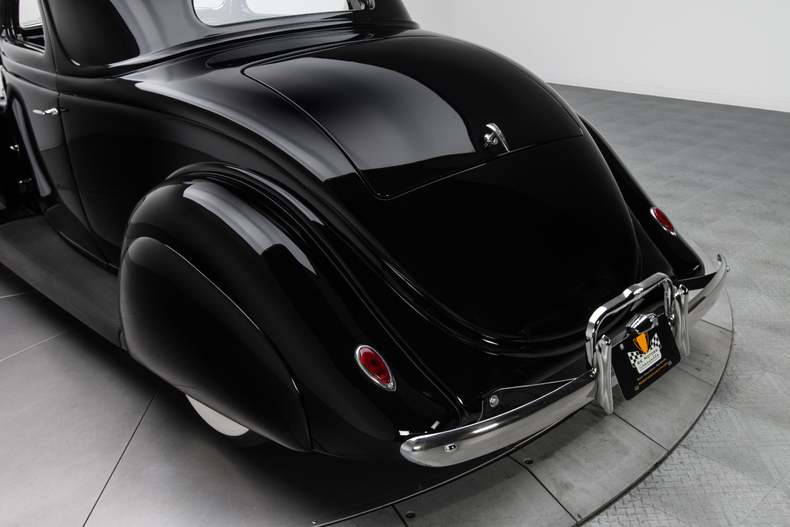 Clean and solid floors, replaced during restoration, are finished in a predictable layer of black. 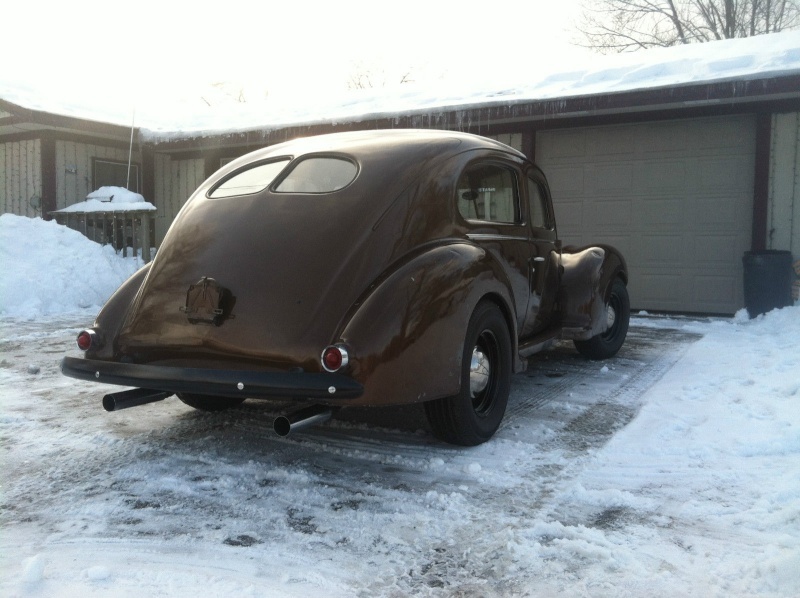 A heavy duty frame, C-notched in the rear to achieve the car's lustworthy stance, is finished to match. 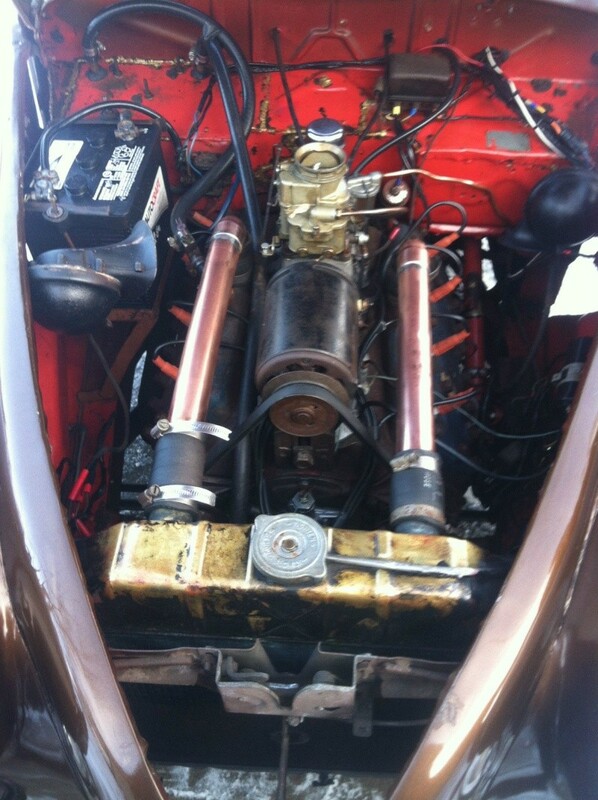 A '40 Ford 3-speed makes good use of a lightened '34 Ford flywheel, a '46 Ford clutch and 19/25 tooth Lincoln gears. 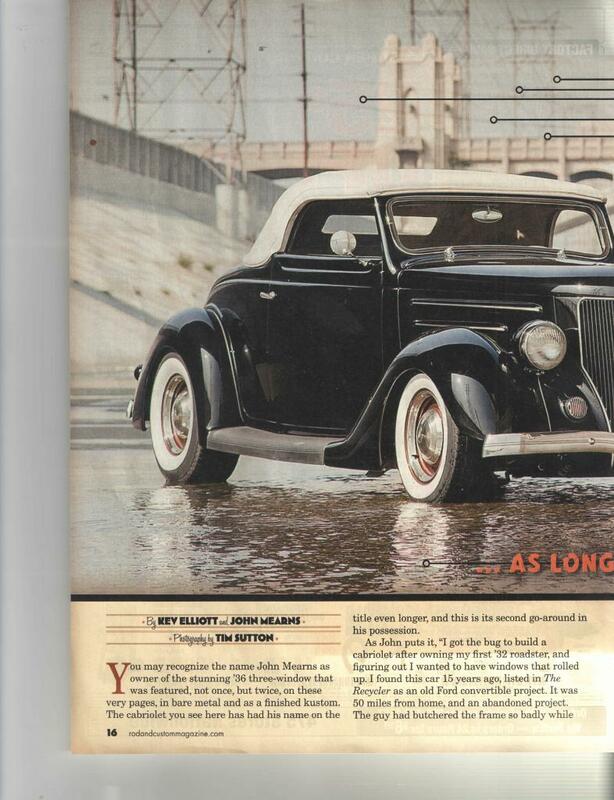 Power flows to a '46 Columbia axle that, thanks to '40 Columbia controls, spins either 4.11 strip scorchers or 2.94 boulevard busters. 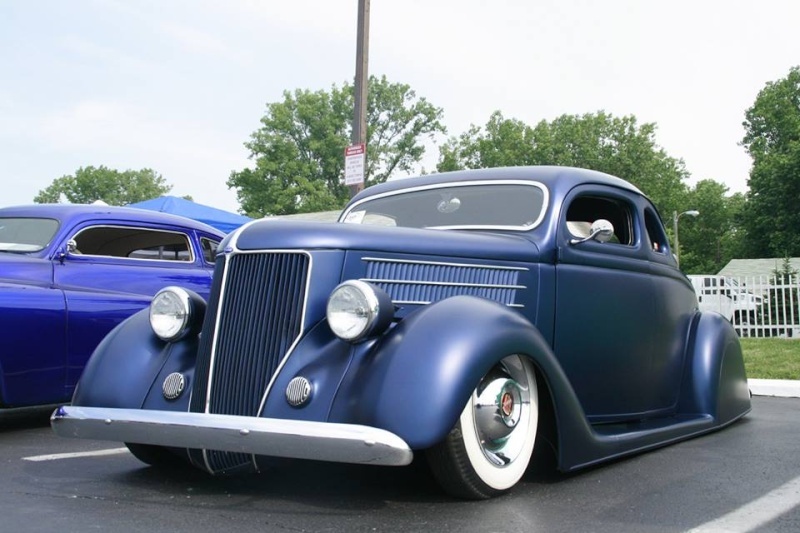 In front of that drivetrain, a '40 Ford suspension hangs a 3.5-inch Mor-Drop axle behind '41 Ford shackles, a '40 Ford steering box and '39 Houdaille shocks. 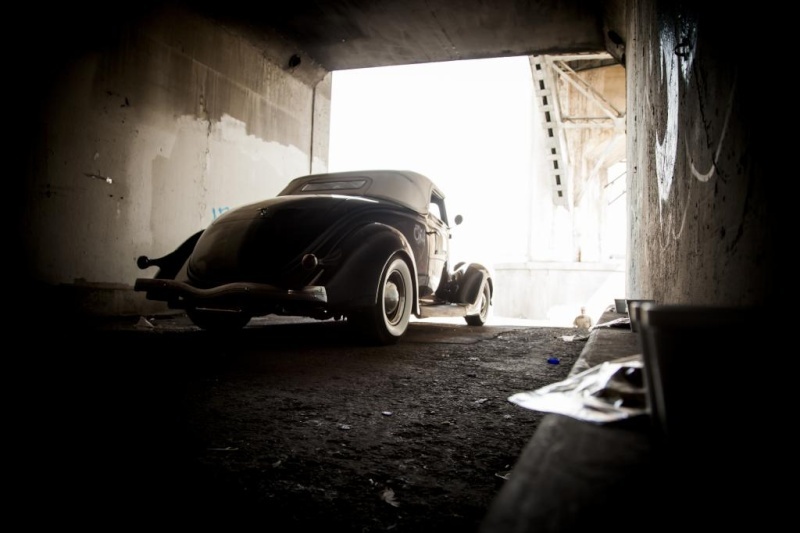 Behind that drivetrain, a second pair of Houdaille shocks combines with a de-arched '37 Ford spring to maintain the car's killer ride height. 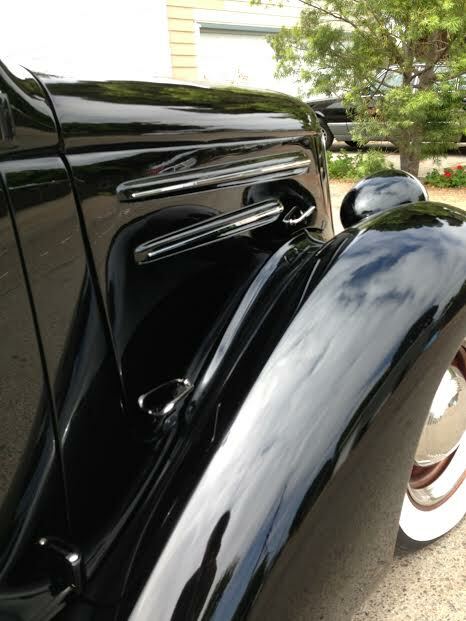 Stops come courtesy of '39 Ford brakes that, naturally, are piped to a '39 Ford master cylinder. 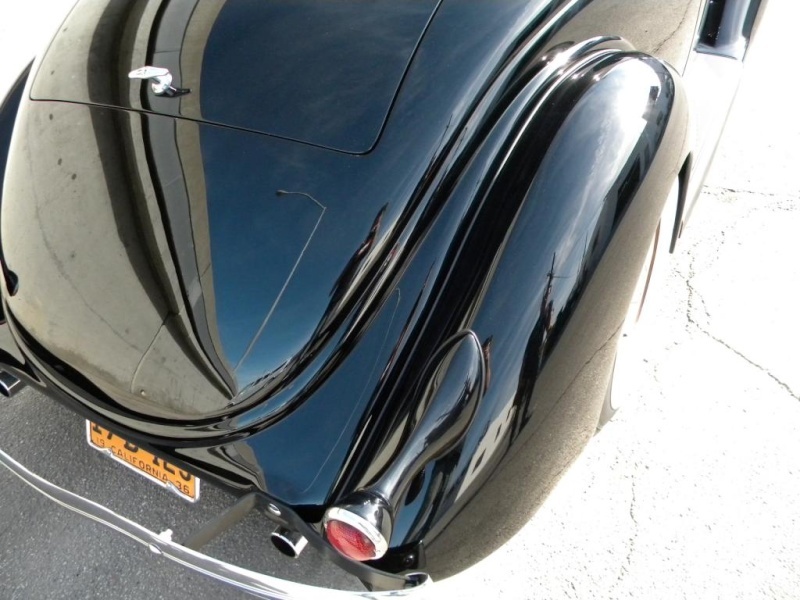 There's an aluminized, true-dual exhaust system, which barks through Mellow Tone glasspack mufflers. 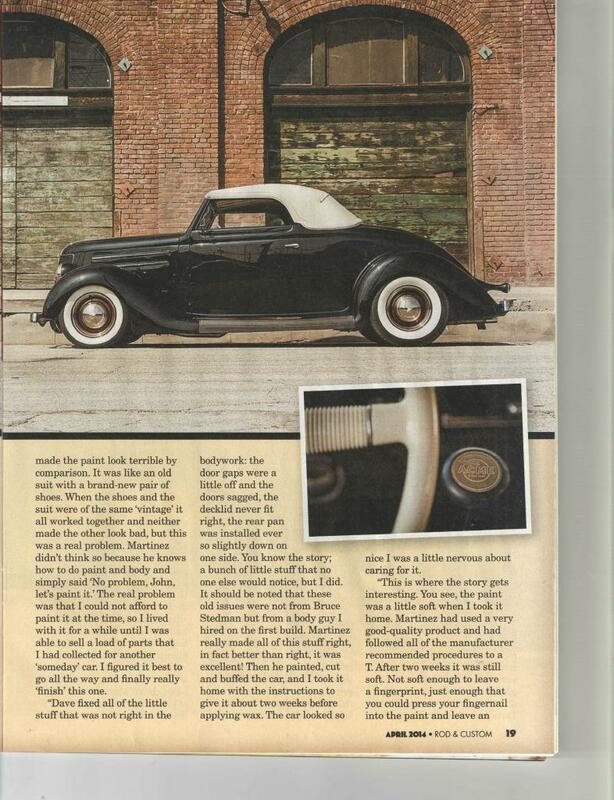 And it all rides on clean, '36 Ford wheels which spin fresh 6.00-16 Firestone Deluxe Champion whitewalls around a fusion of '36 Zephyr trim rings and '37 Ford center caps. 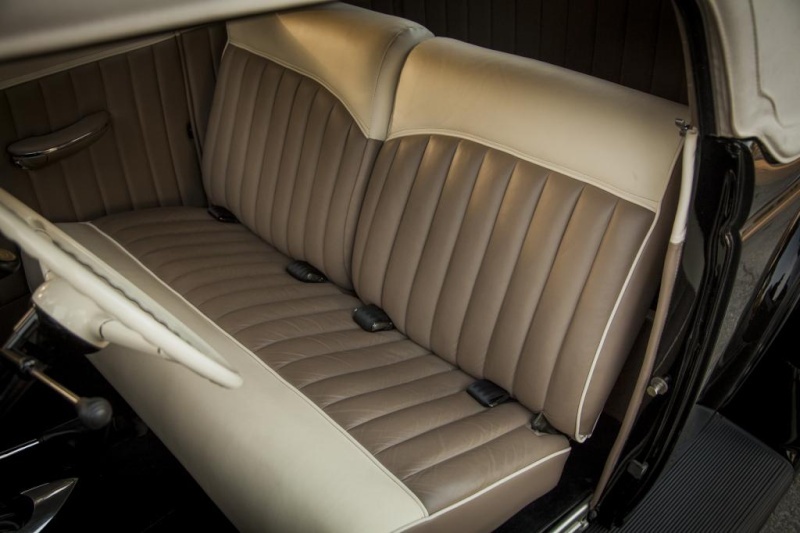 Pop this coupe's doors and you'll find an attractive Naugahyde interior that was installed by Burt Litton of Burt Litton Street Rods. 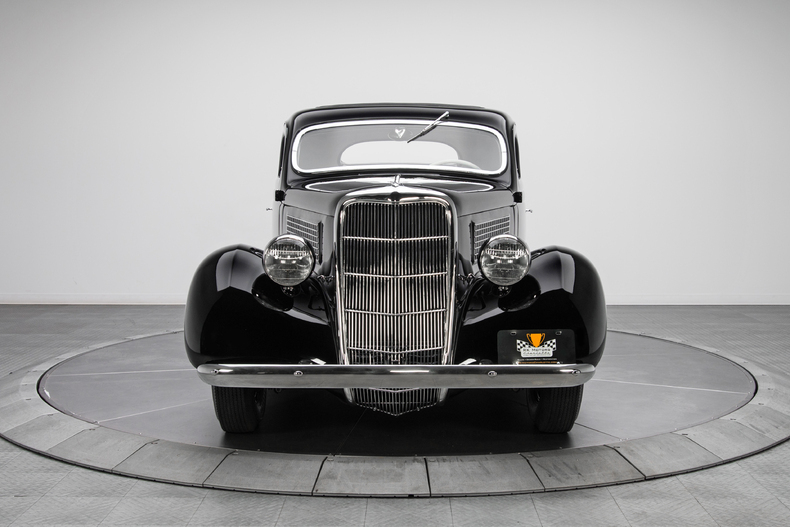 At ground level, black carpet weaves a thick cover between a chrome HaDees heater, '39 Ford foot pedals and "V8" branded sill plates. 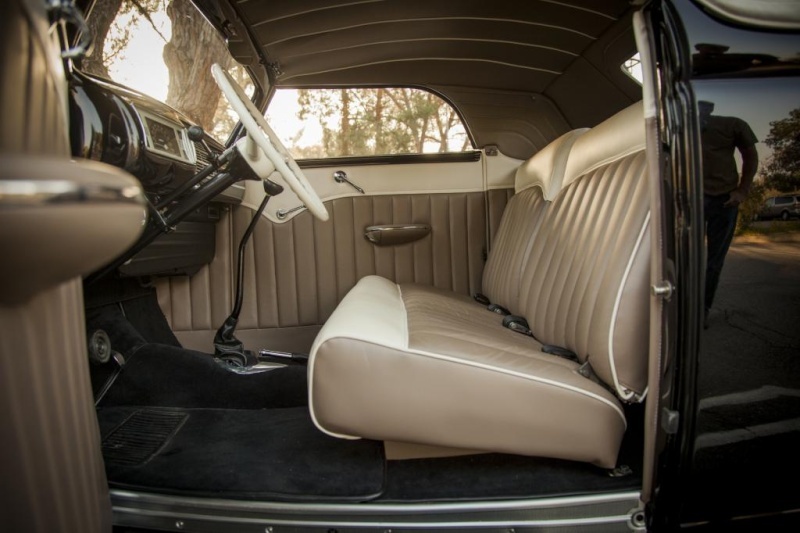 At the front of that carpet, a body-matched dash, which marries the bottom section of a '40 Ford with the top section of a '35 Ford, allows use of the car's stock windshield roll-out mechanism. 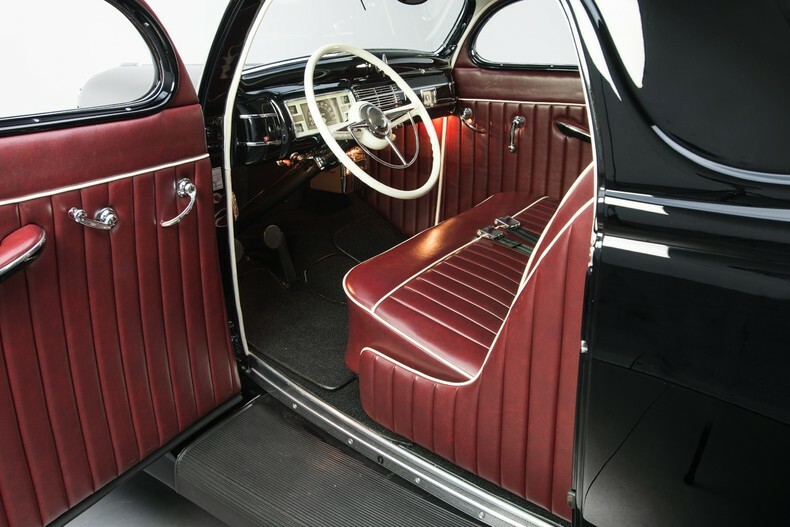 Seating is provided by a '36 flip-up bench, which has been lowered over a modern JVC CD player. 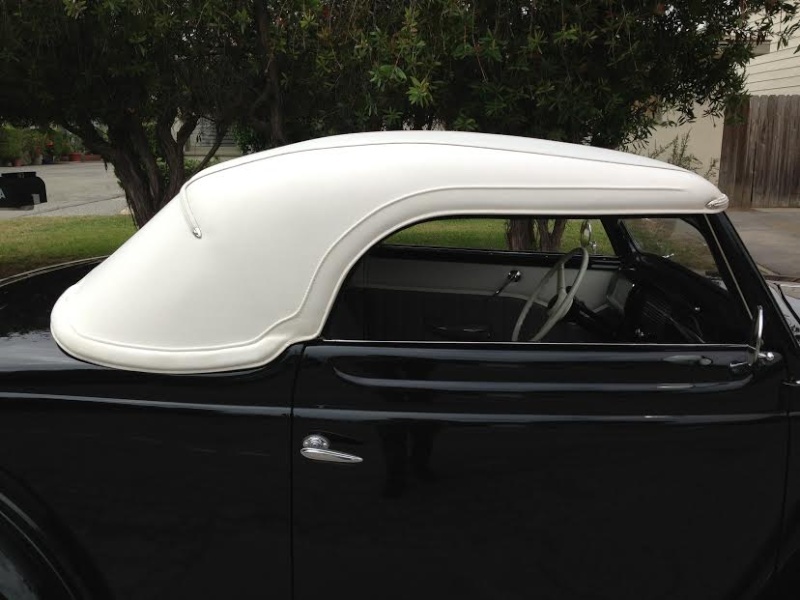 Above that seat, a custom headliner centers a small dome lamp behind an oval rearview mirror. 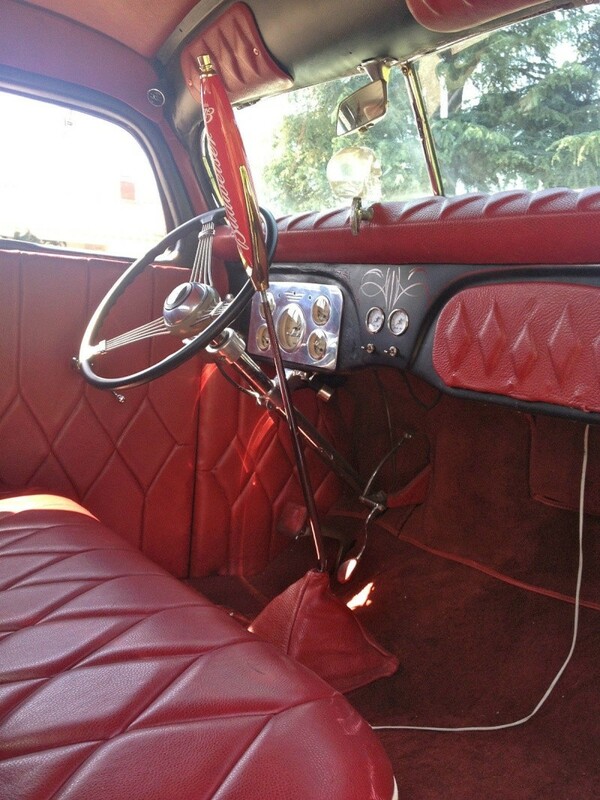 In front of the driver, a '41 Mercury steering wheel laps a chrome shifter, a '40 Ford column and a modified '40 Ford harness. 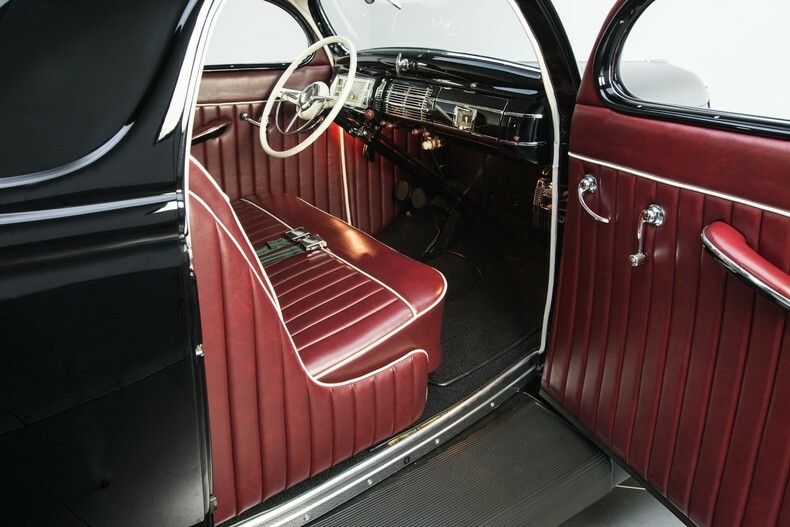 At the sides of the passengers, custom door panels hang '49 Chevy armrests and '36 Plymouth handles behind a '40 Ford emergency brake. 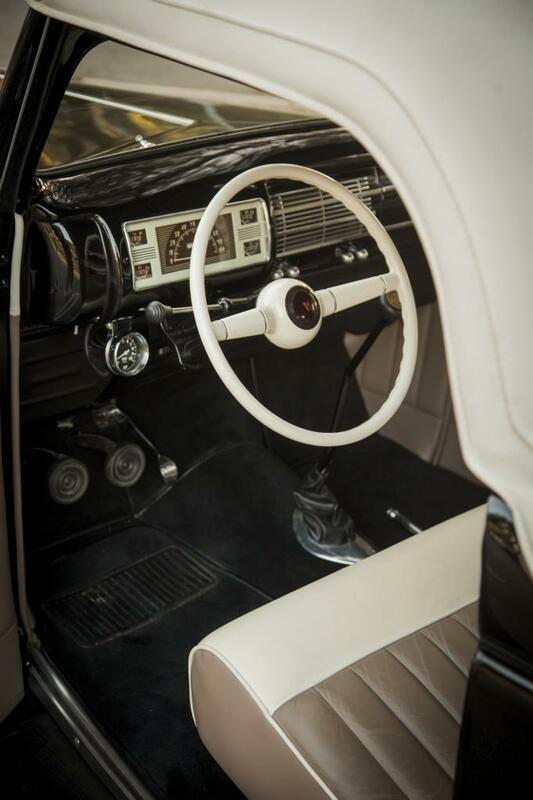 And behind the cockpit, a super clean trunk grants access to a modified fuel filler. 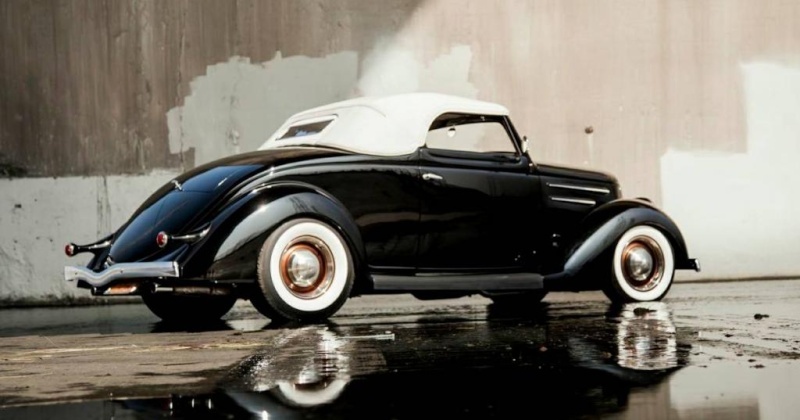 Stylish and alluring, this striking custom is a bellwether of pre-war creativity. 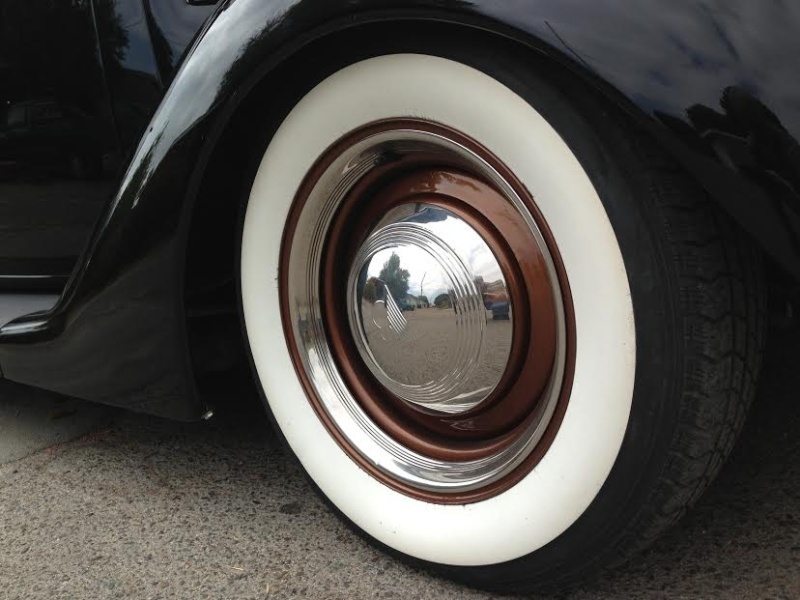 Virtually every piece of this blue chip blue oval fulfills a vision that's equal parts purpose and class. 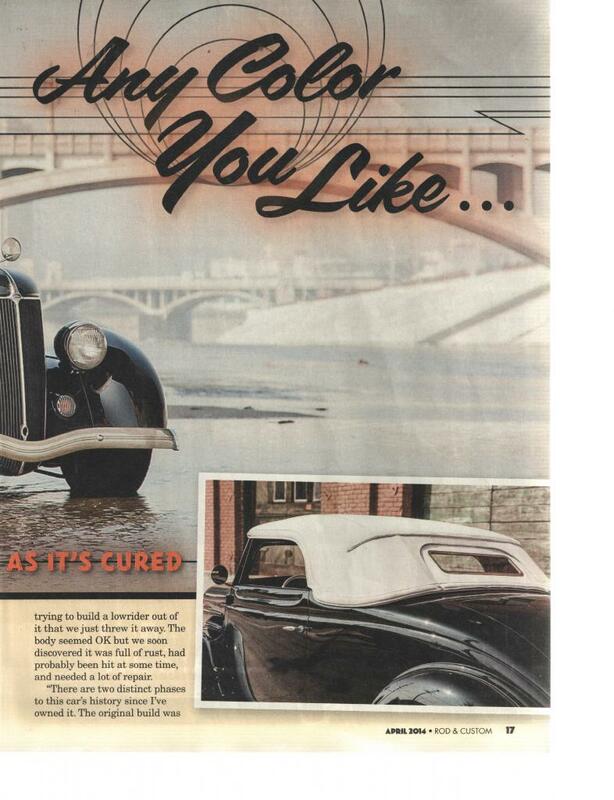 You really can't ask for a more authentic blend of old school style and era-correct driving characteristics. 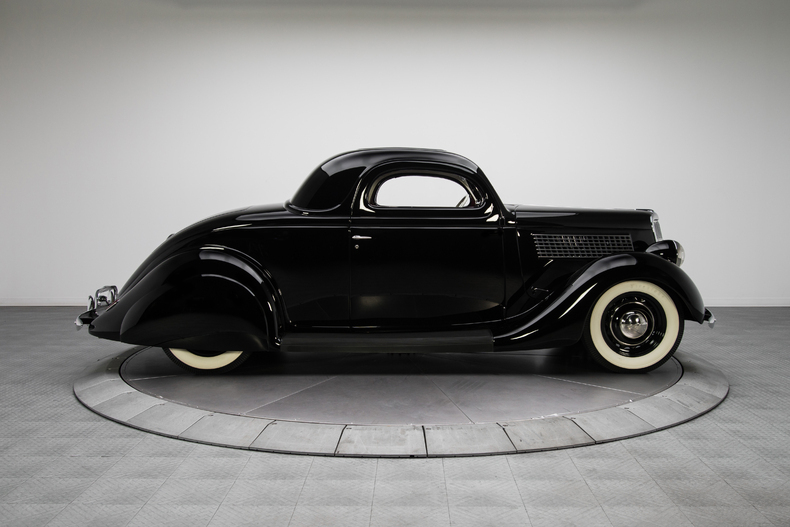 And you certainly can't build anything this nice for the time or money it takes to drive out of our RK Motors Charlotte showroom. 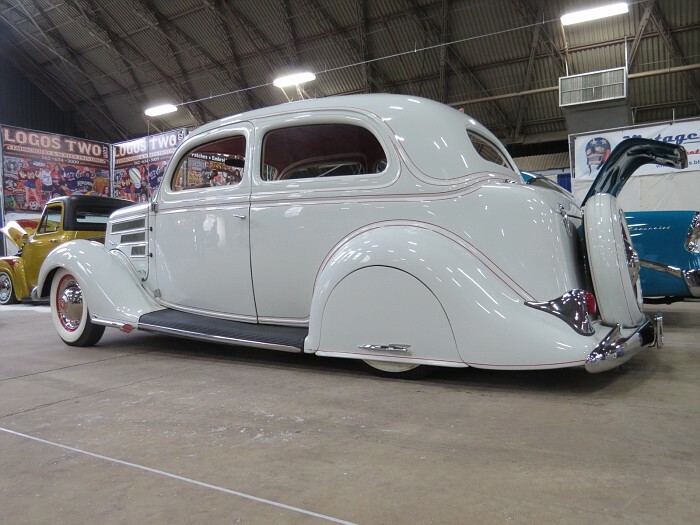 Step up to something different - this Ford 3-window is ready to show AND go! 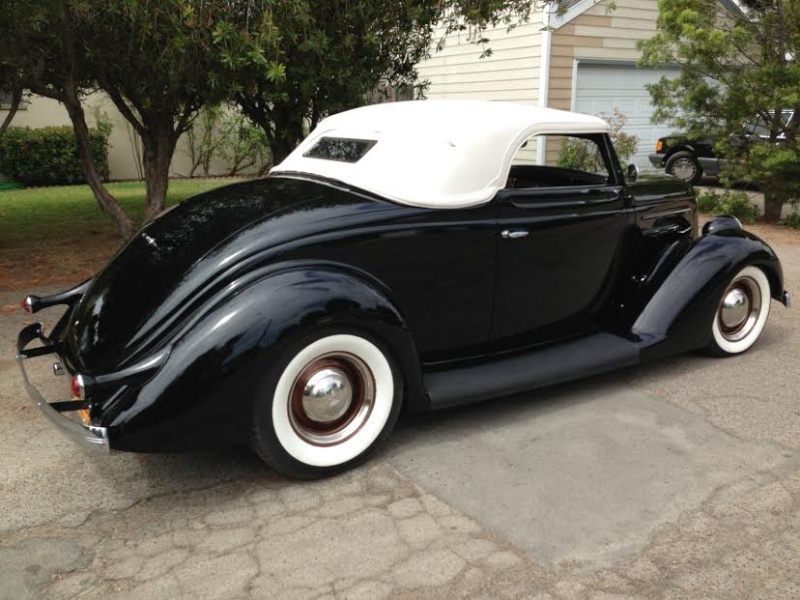 This '36 Ford Cabriolet looks and drives like an absolute dream. 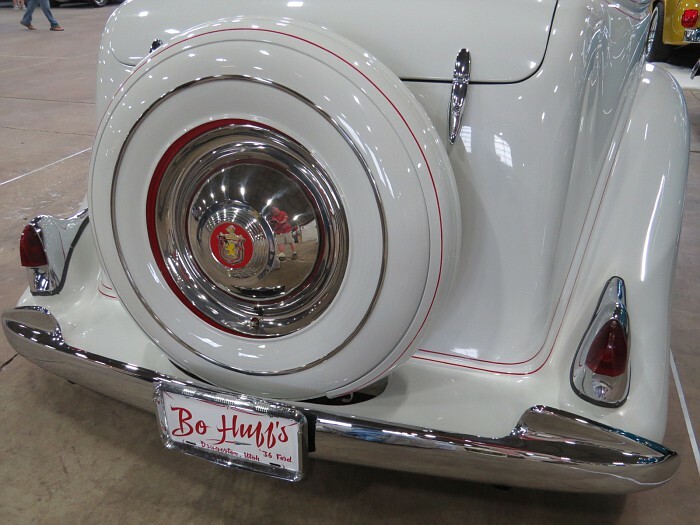 The engine fires right up and settles into a steady rumble through the dual exhaust with switchable electric exhaust dumps behind the front fenders. 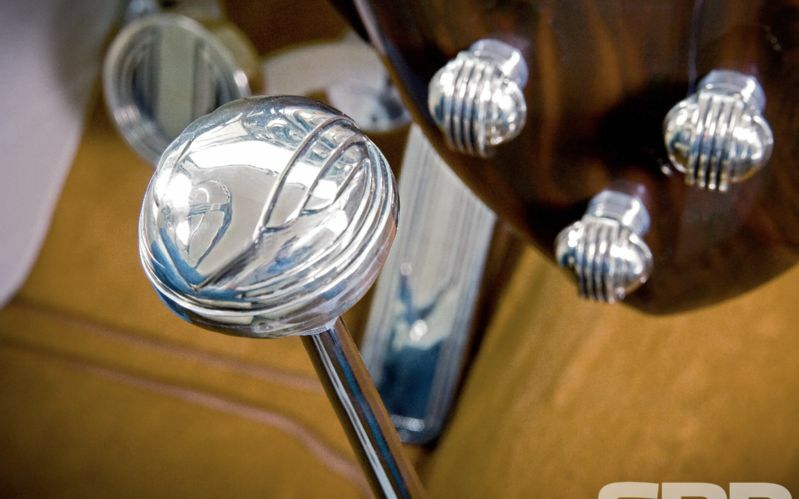 The 5-Speed manual overdrive transmission shifts smoothly into each gear. 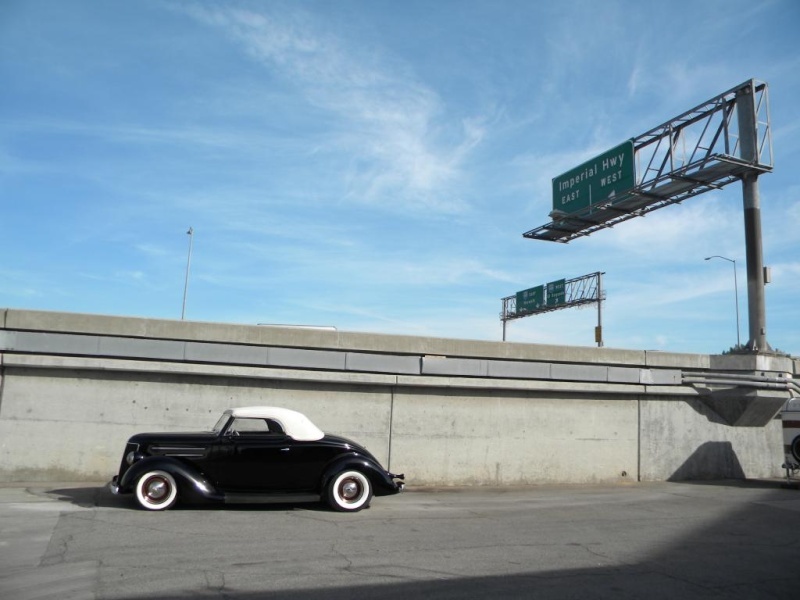 The cars tracks straight as an arrow while driving and looks just as good cruising down the highway as it does sitting in your driveway. 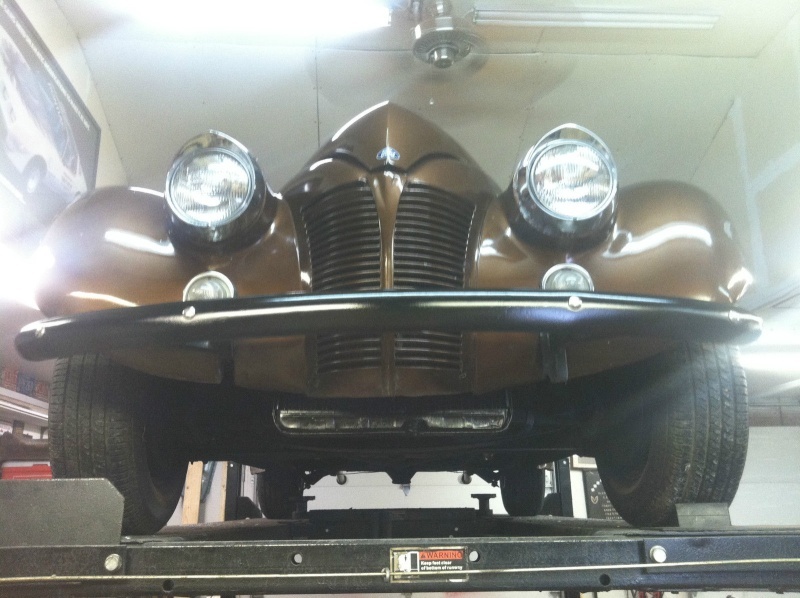 Power steering and front disc brakes keep things under control with the TCI Chassis. 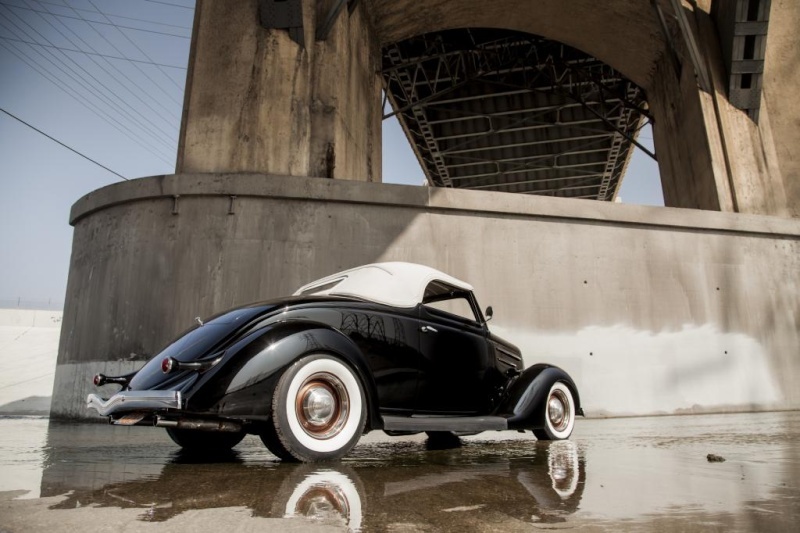 Built with a traditional Hot Rod stance and style, yet it is a custom with the ease of driving a more modern car. 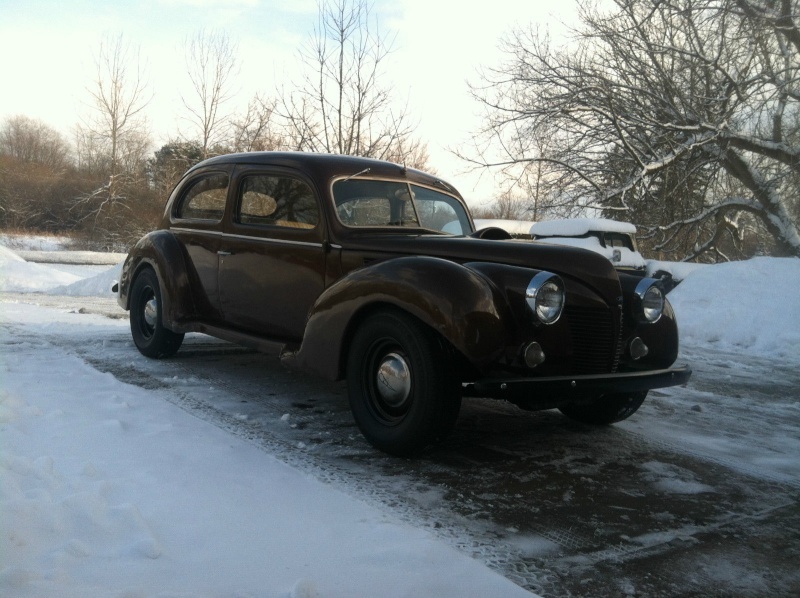 It is surprisingly nice and easy to drive. 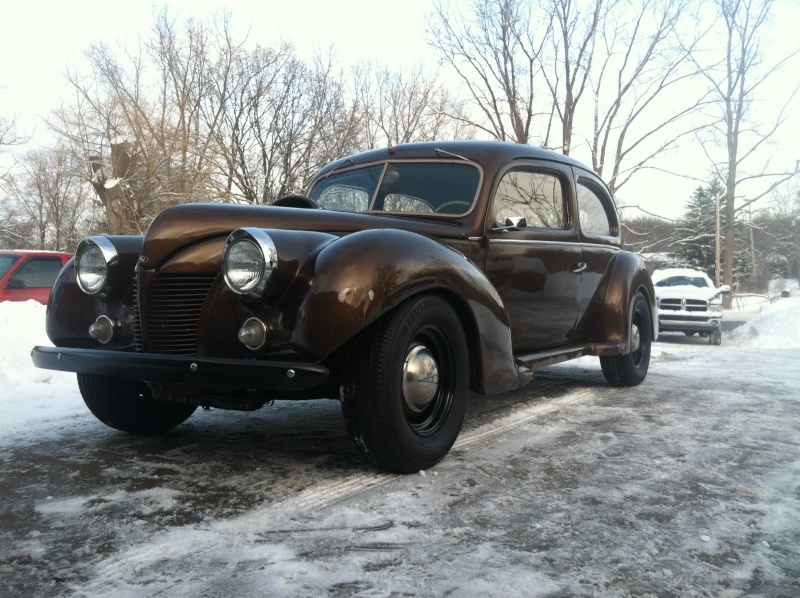 There are only a couple hundred miles on this car since it has been cosmetically redone. 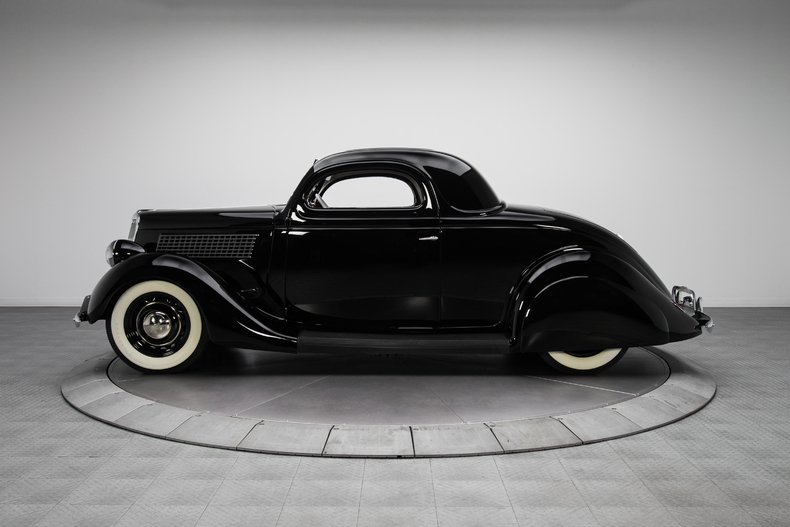 1937 Ford pickup, Corvette 327, 350Trans, Chopped , Bagged , Mustang II, Notched, 4 linked, Ford 9' rear, 1956 Packard Taillights, Custom Tailgate, 1937 Buick headlights, New Interior, Dolphin gauges, New redtop optima Battery, New WWW tires, New door poppers/Bear claw latches, OG 37 plates, New Brakes/ brake lines, master cylinder , Super reliable daily driver, turns heads everywhere! 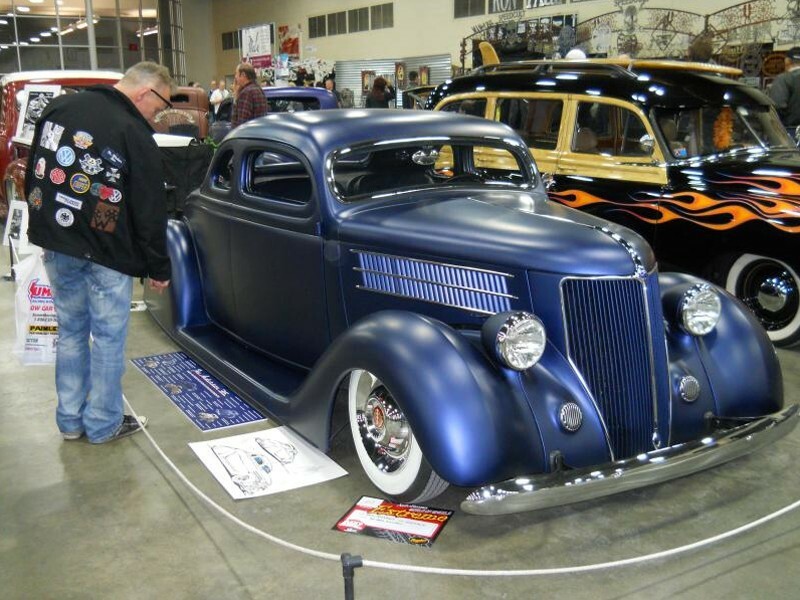 one of a kind custom, Very popular truck!